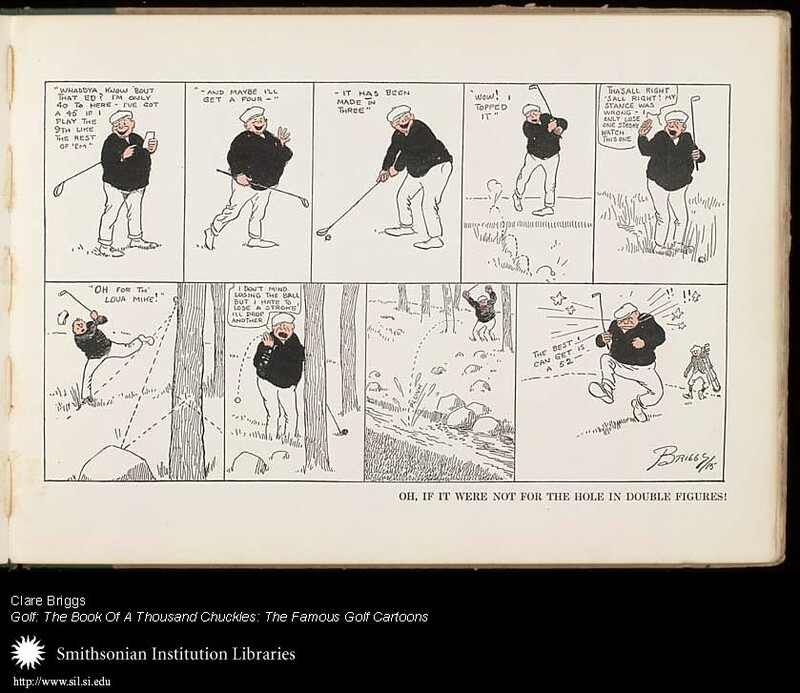 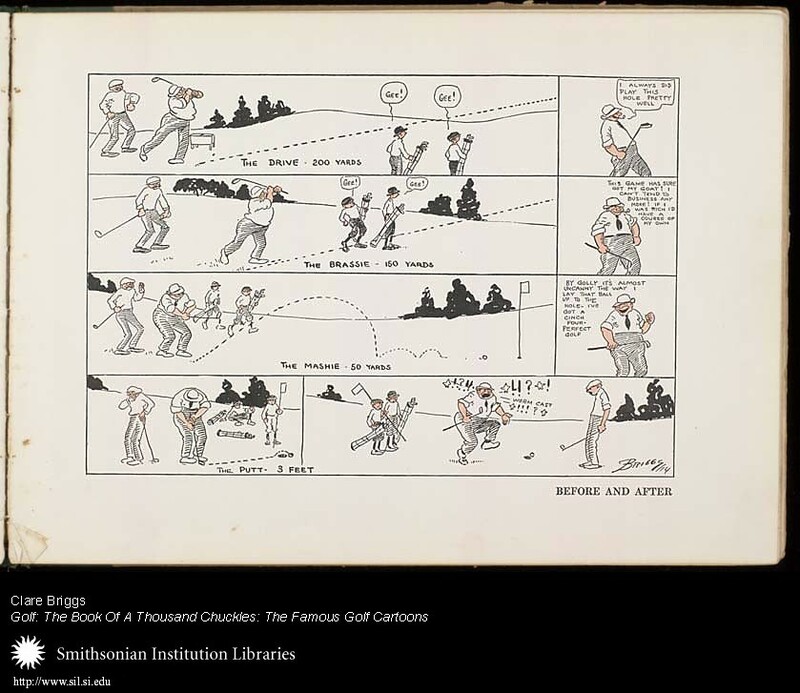 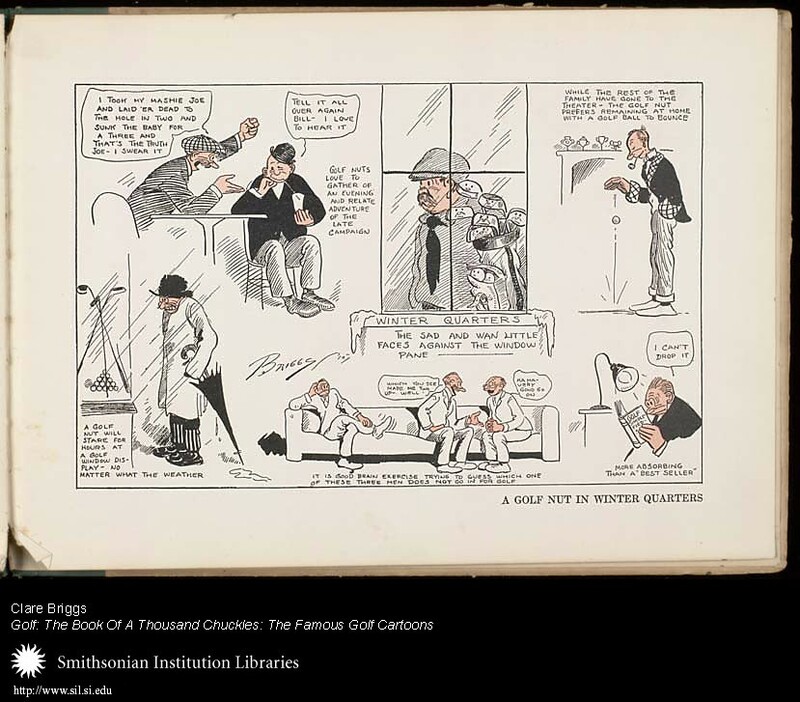 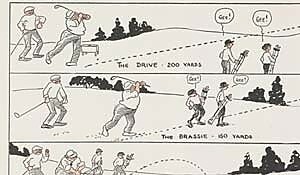 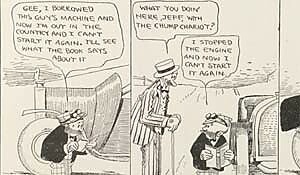 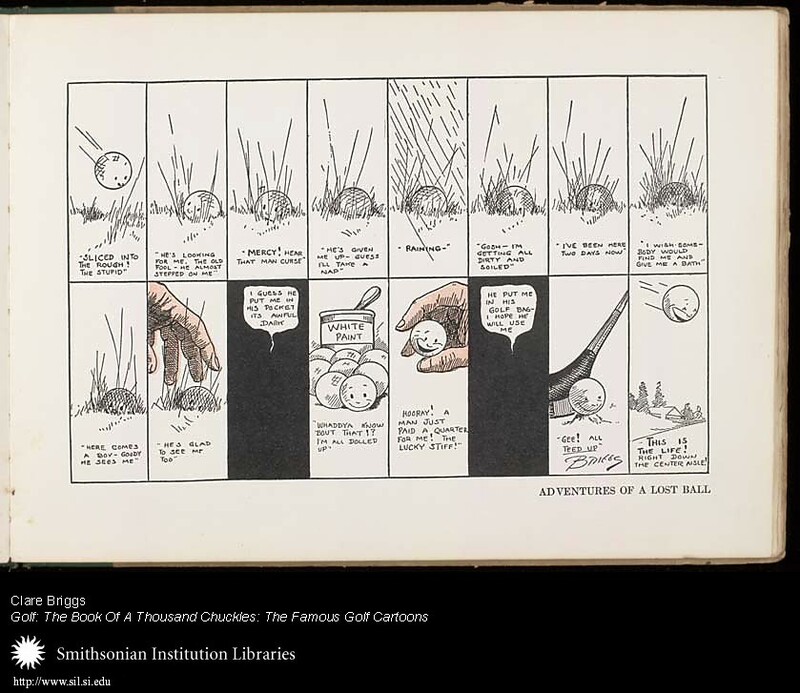 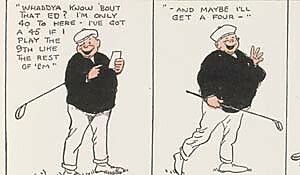 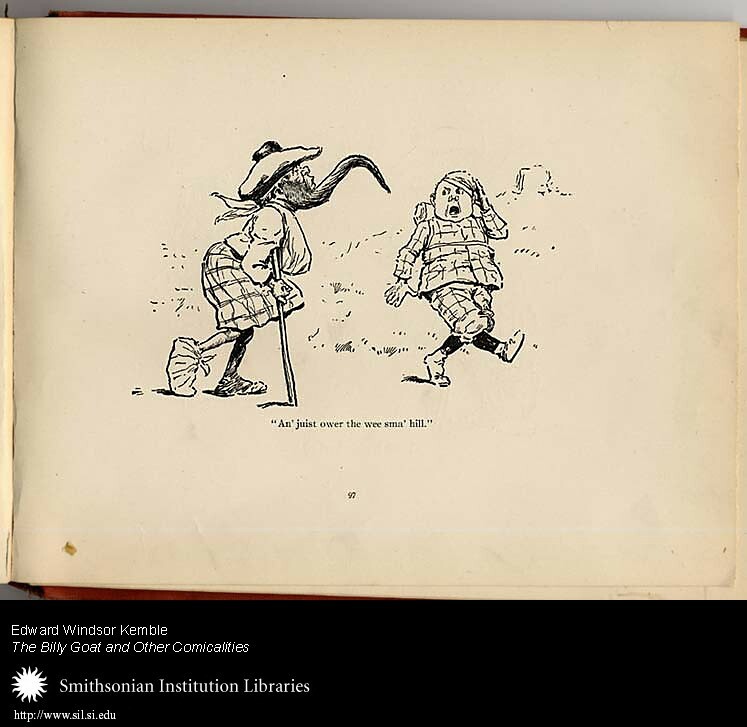 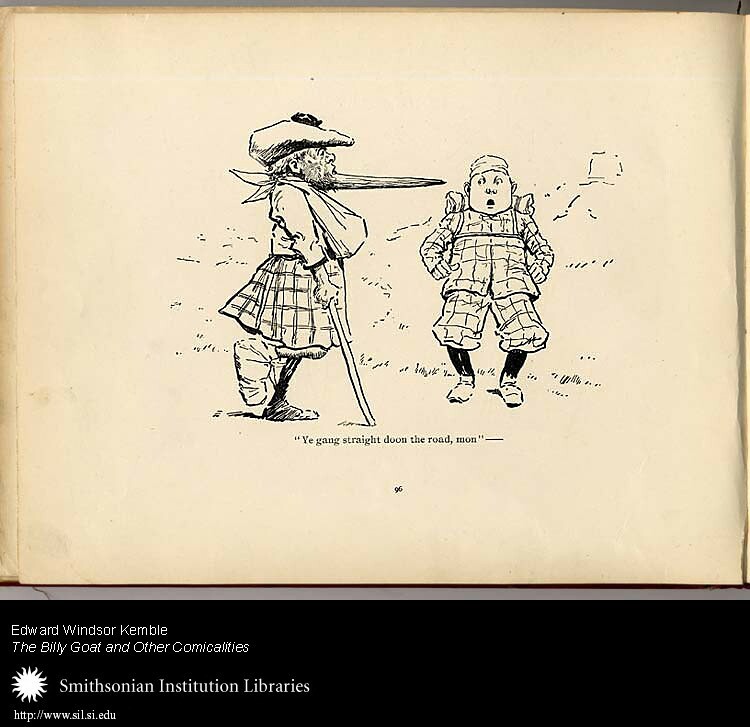 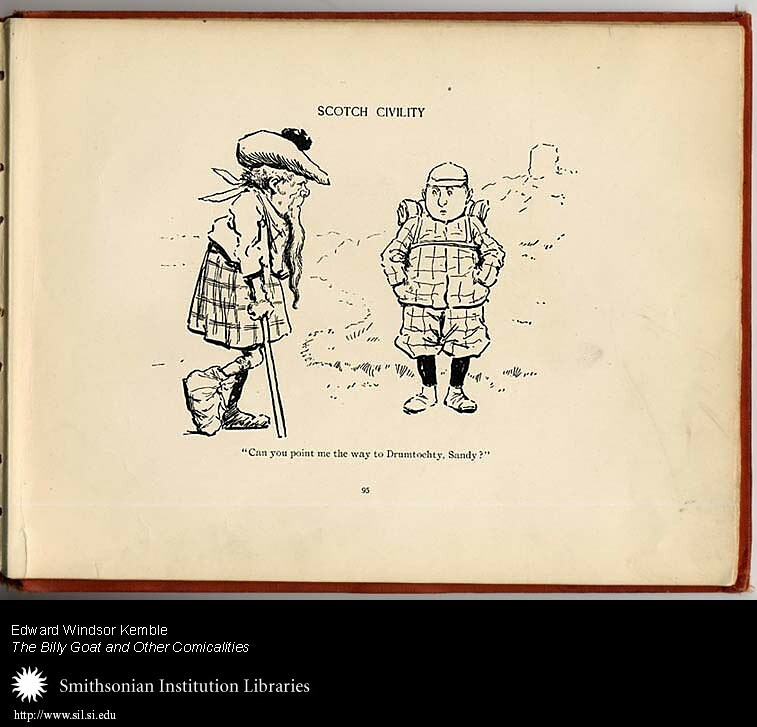 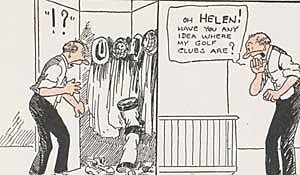 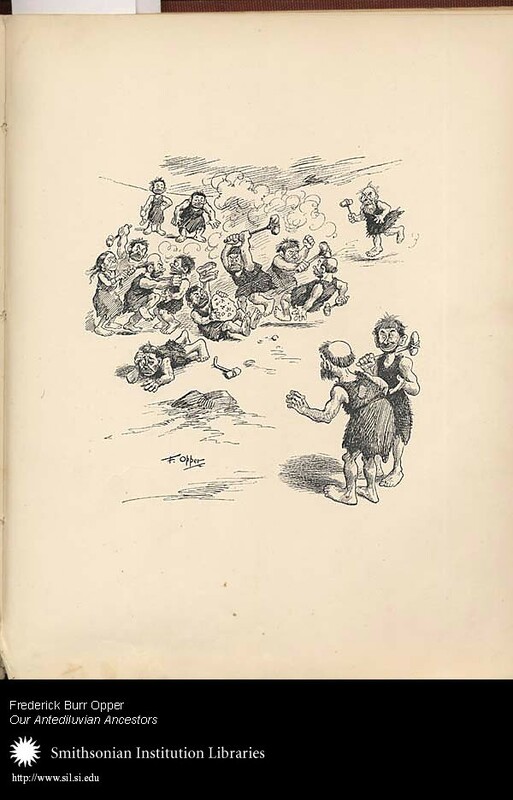 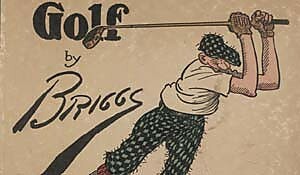 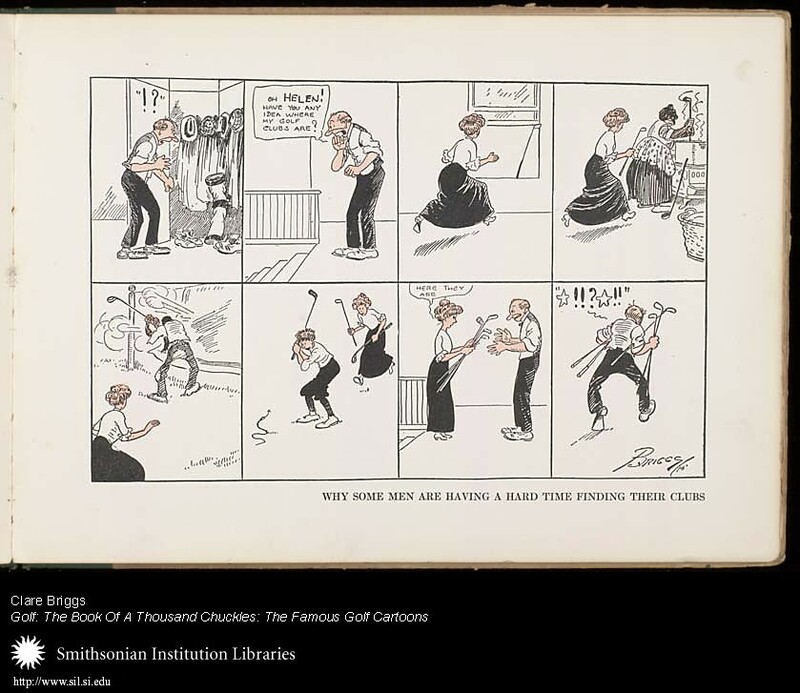 Book: Clare Briggs, Golf: the book of a thousand chuckles: the famous golf cartoons, c1916. 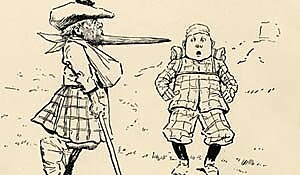 Image Caption: Oh, If it were not for the Hole in Double Figures! 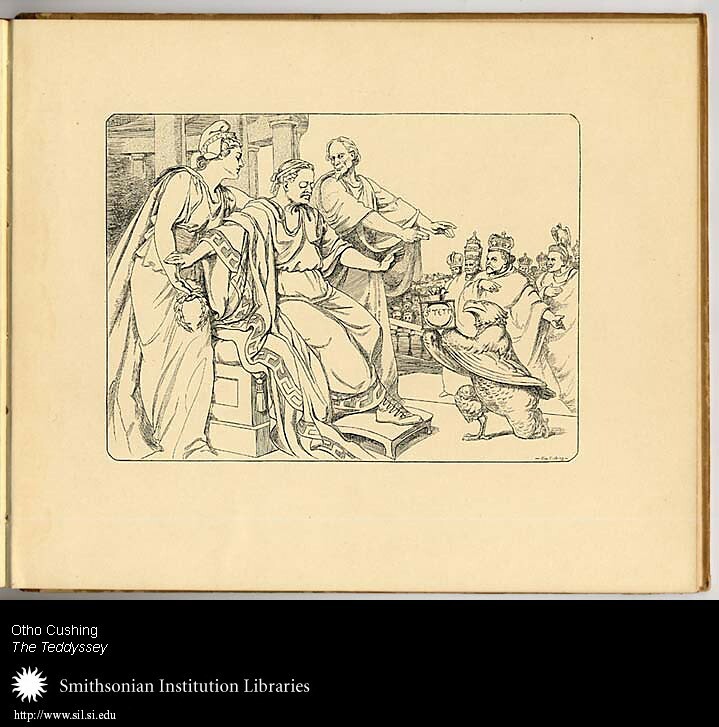 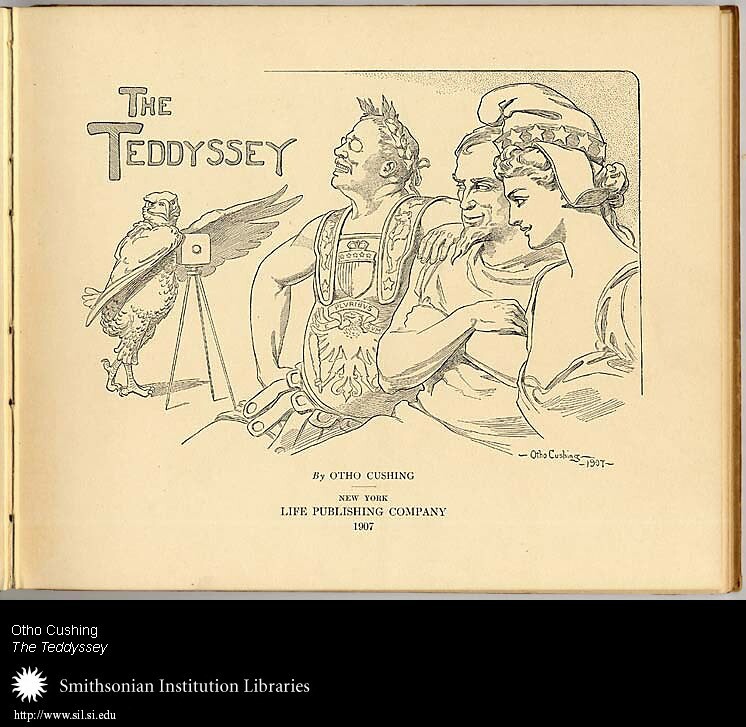 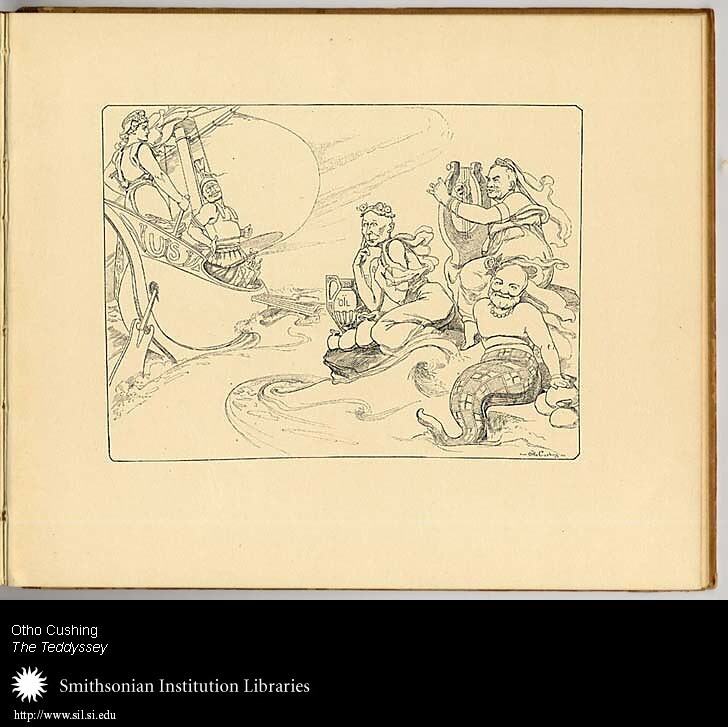 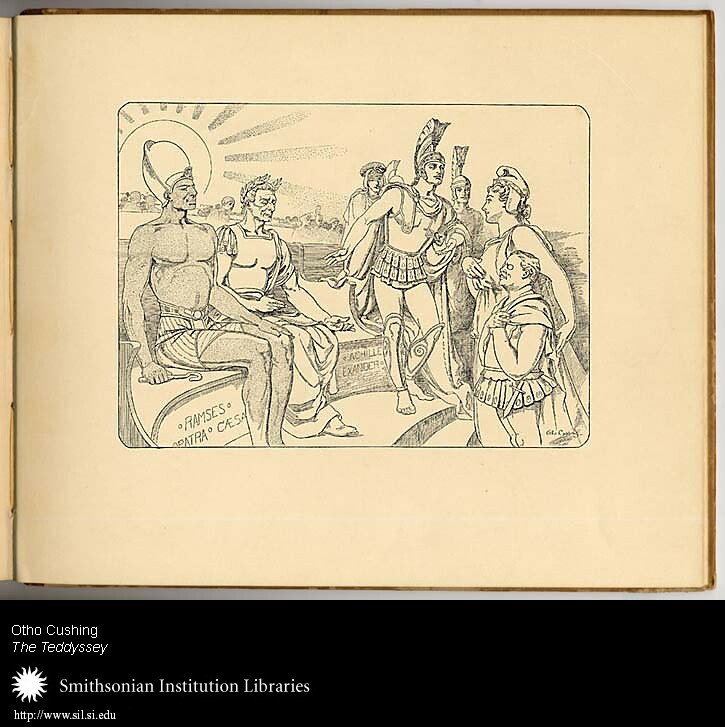 Image Caption: Book VI--Temptation -- "The Sirens try to lure Teddysses to the 'Rocks,' but having bound himself to the Ship of State, Columbia steers him through"
Book: Otho Cushing, Teddyssey, 1907. 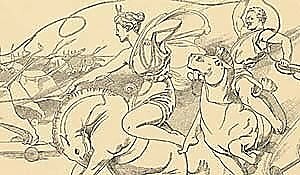 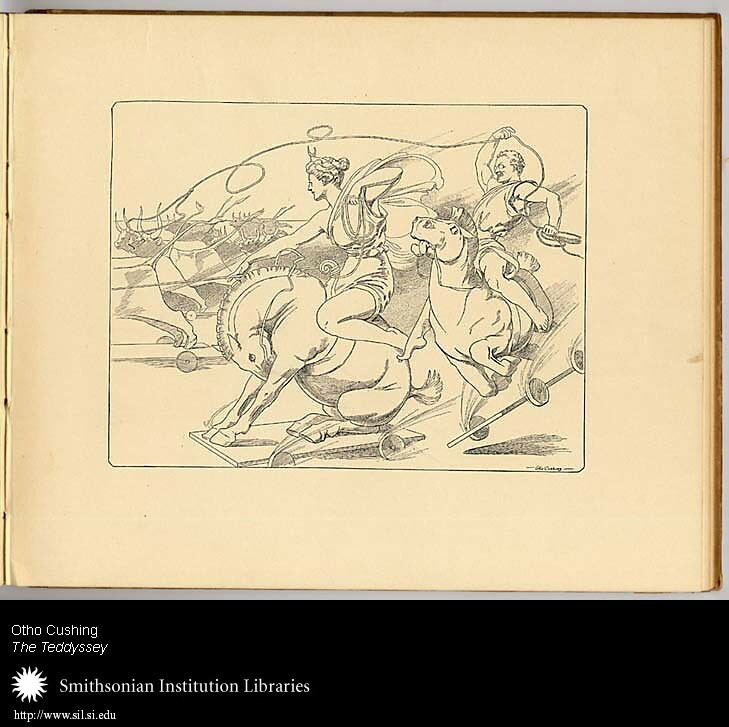 Image Caption: Book II--Youth -- "The Goddess of hunting, at the the request of Pallas Columbia, accustoms Teddysses to the perils of the chase"
Image Caption: Book IX--Incantation -- "Pallas Columbia warns Teddysses against the magic oil of the enchantress Circe, which had turned so many of his comrades into swine"
Image Caption: Book X--Iteration -- "ZE U.S., Pallas Columbia, the people, foreign rulers, all beseech Teddysses to retain the empire"
Image Caption: Book XI--Apotheosis -- "Pallas Columbia requests for him a place in history"
Book: Harry Conway (Bud) Fisher, Mutt and Jeff Cartoons: Book Two, 1911. 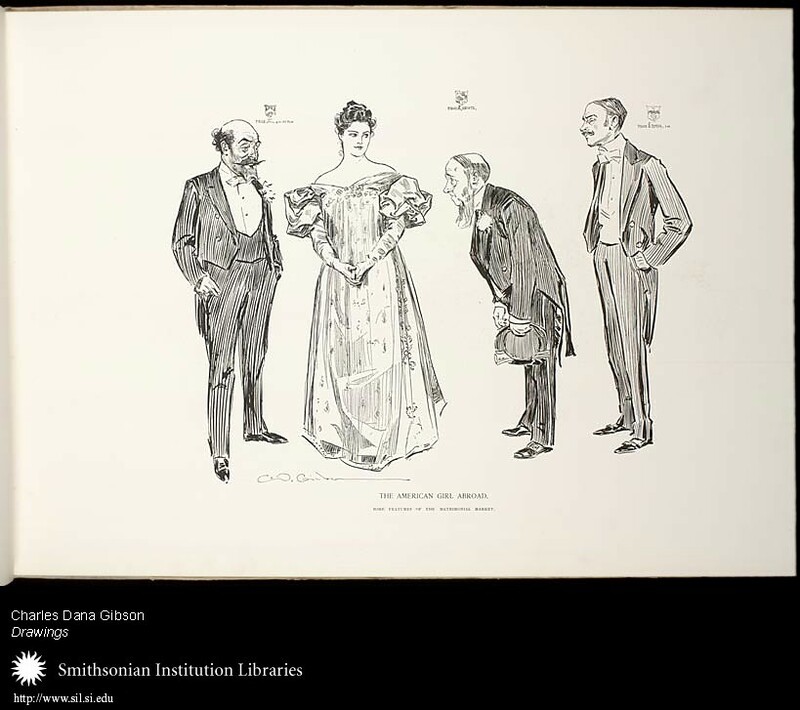 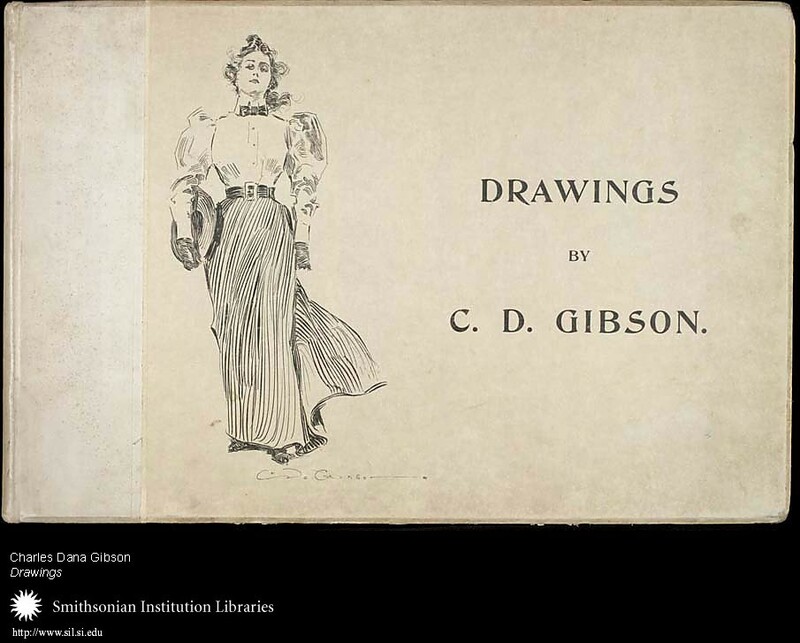 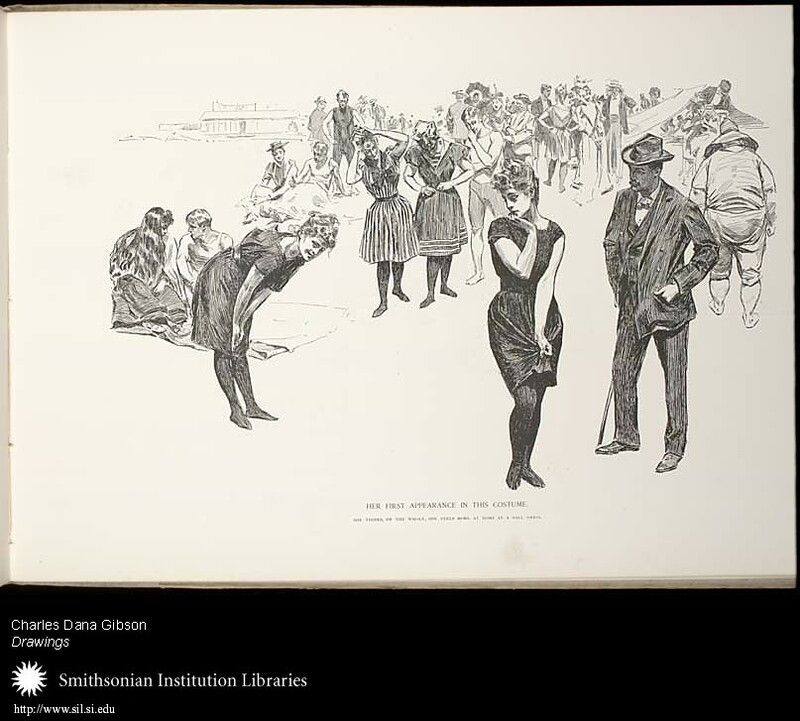 Book: Charles Dana Gibson, Drawings, 1894. 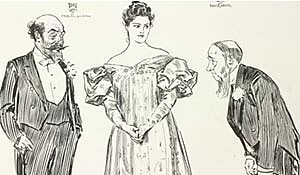 Image Caption: Her First Appearance in This Costume: She Thinks, On the Whole, She Feels More at Home in a Ball Dress. 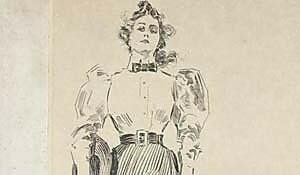 Kentometary: A theme that recurs often in Gibson’s drawings is the 19th century practice of American women from better families seeking husbands from old, European nobility. 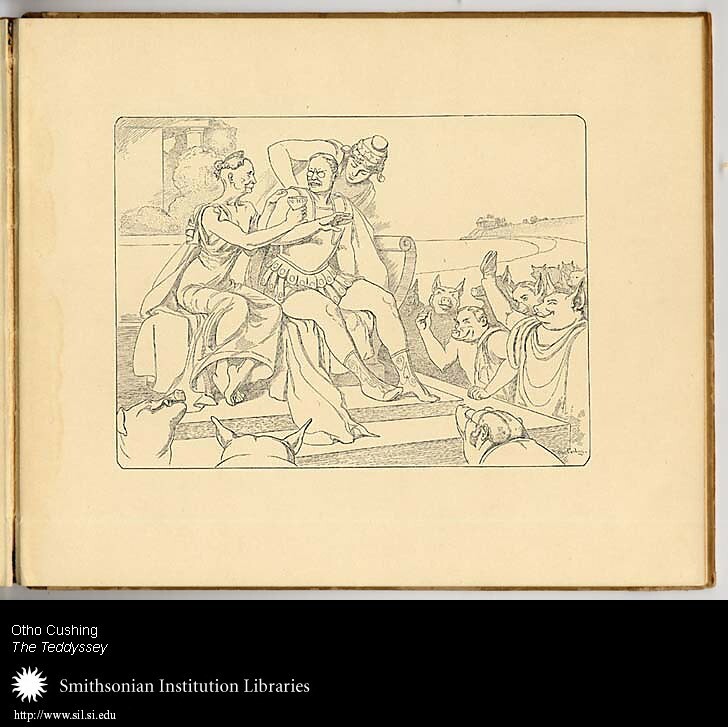 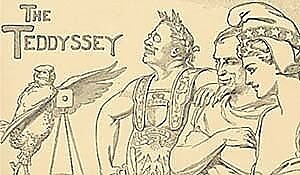 In this allegory, the Roman Colosseum is the setting in which Cupid sacrifices America’s youthful women to the British aristocracy. 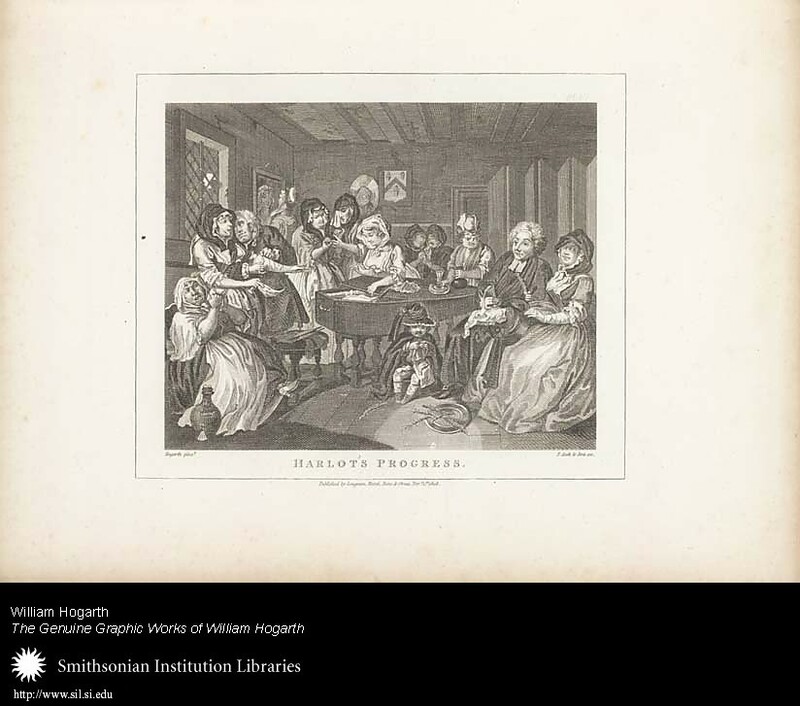 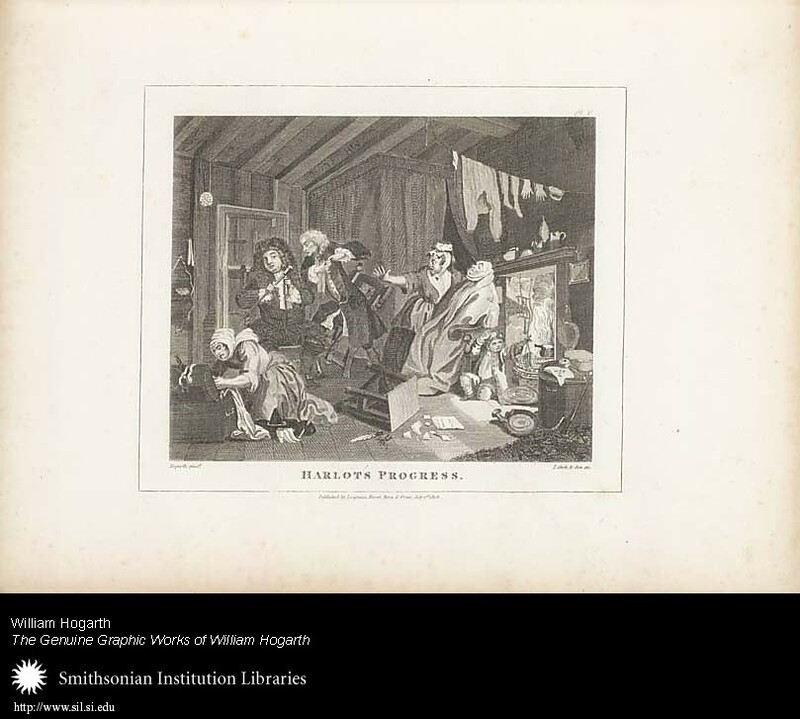 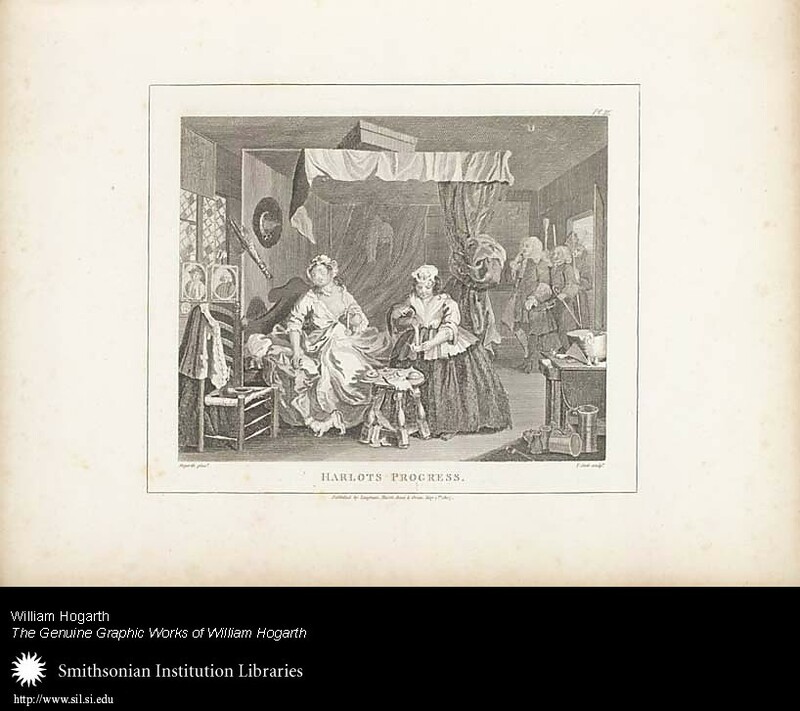 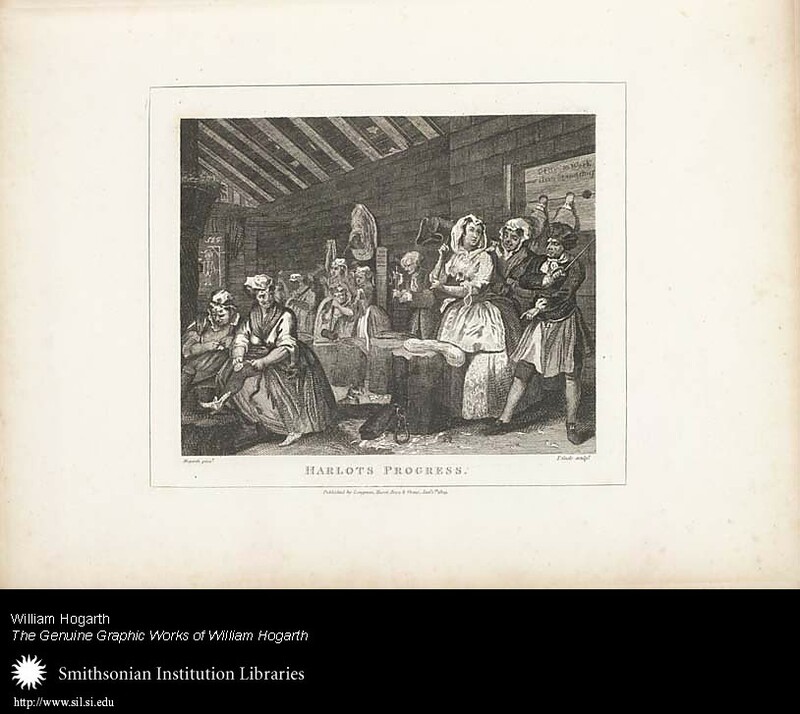 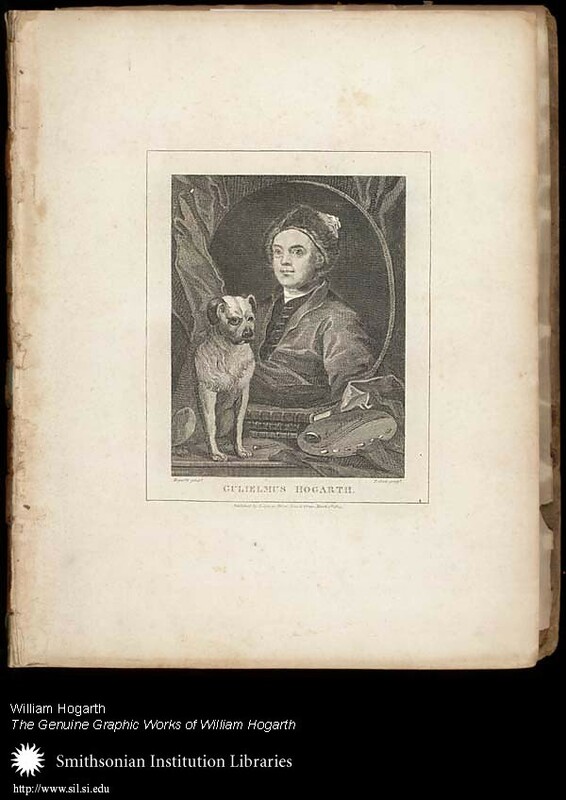 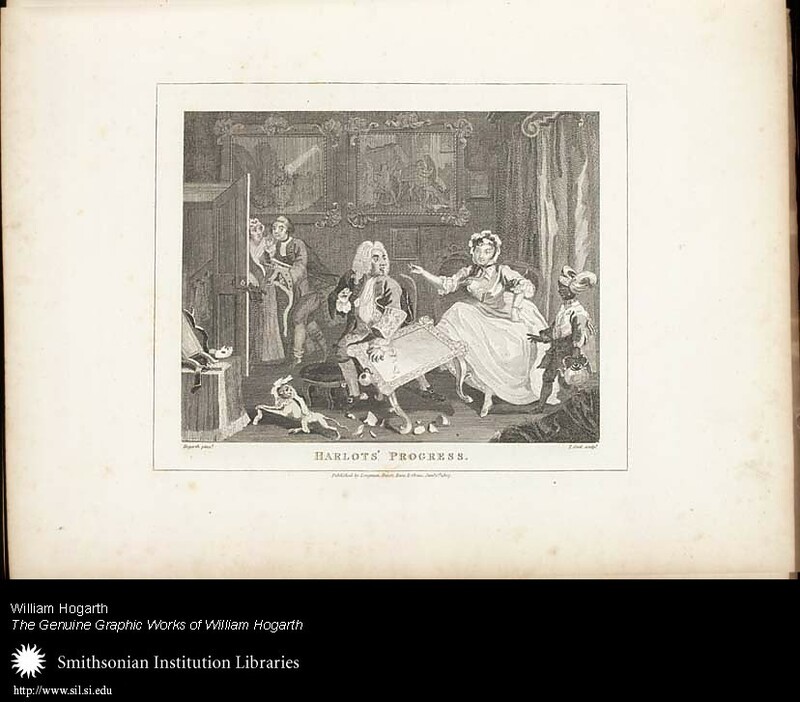 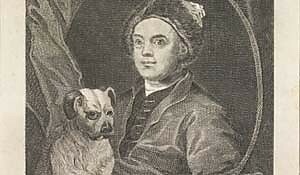 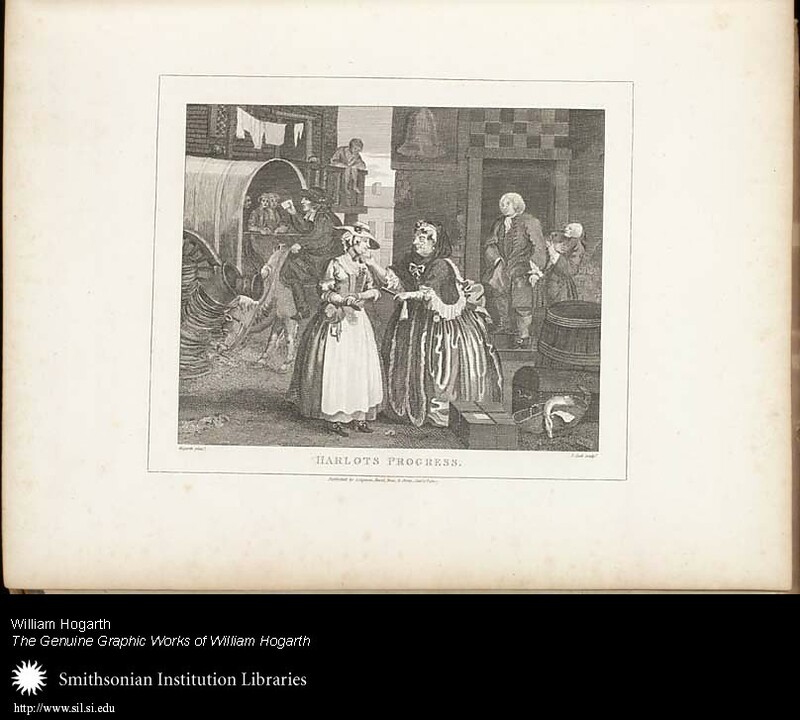 Book: William Hogarth, Genuine Graphic Works of William Hogarth: Consisting of 160 Engravings Faithfully Copied from the Originals, 1813. 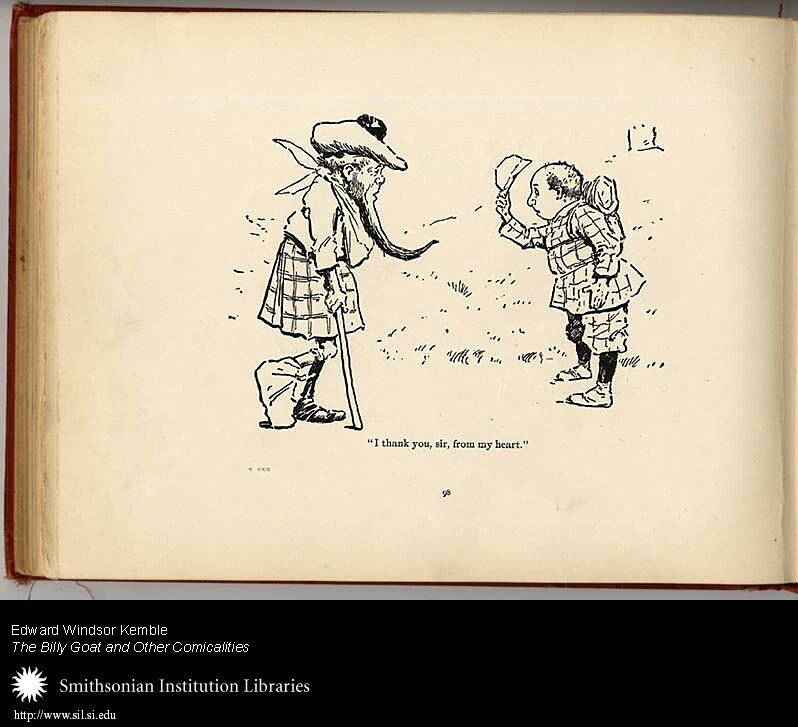 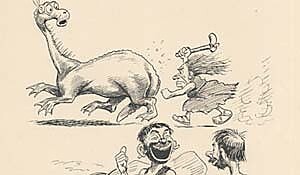 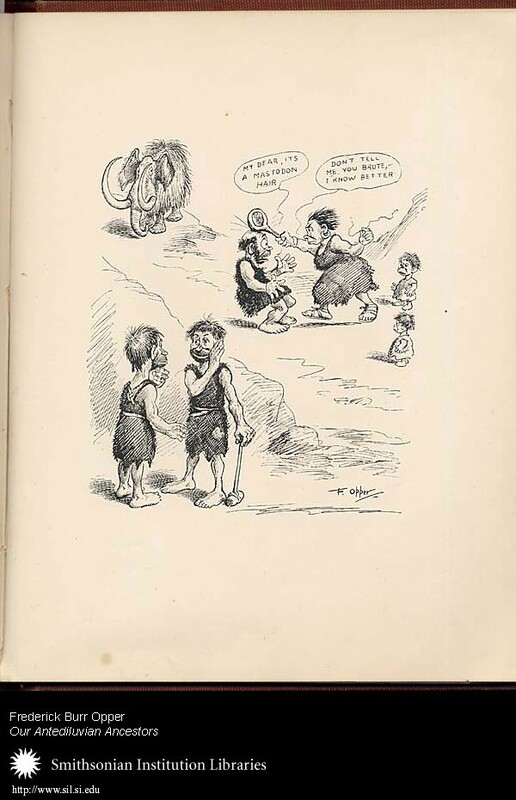 Book: Edward Windsor Kemble, Billy Goat and Other Comicalities, 1898. 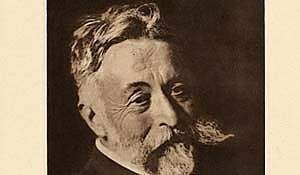 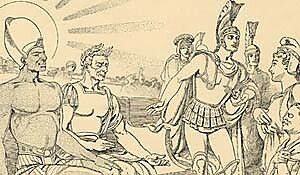 Image Caption: "I thank you, sir, from my heart." 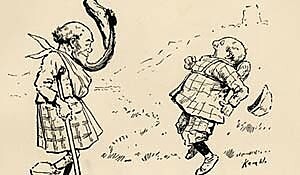 Image Caption: "Dinna mention it, mon." 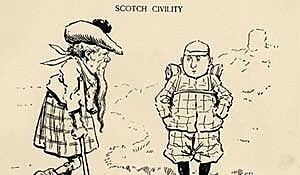 Image Caption: Scotch Civility: "Can you point me the way to Drumtochty, Sandy?" 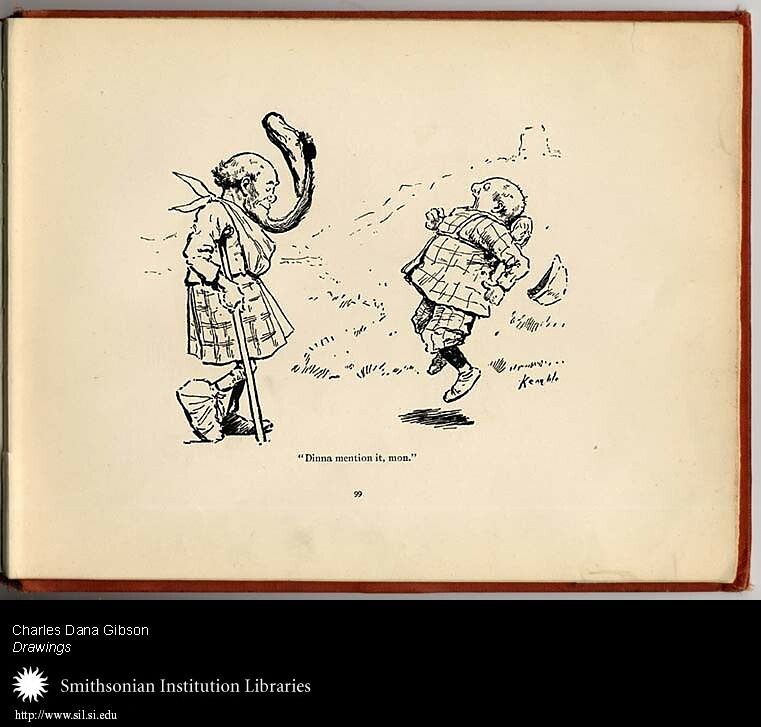 Image Caption: "An' juist ower the wee sma' hill." 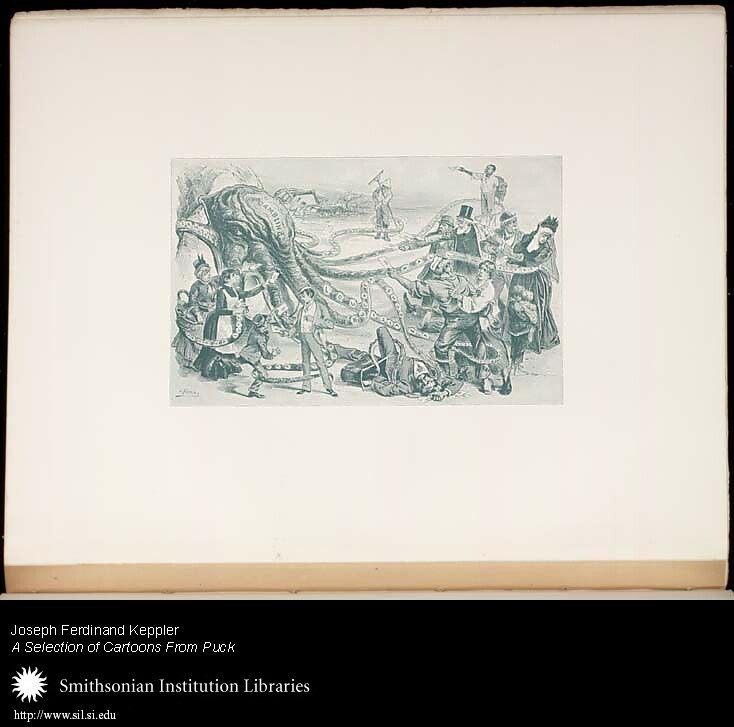 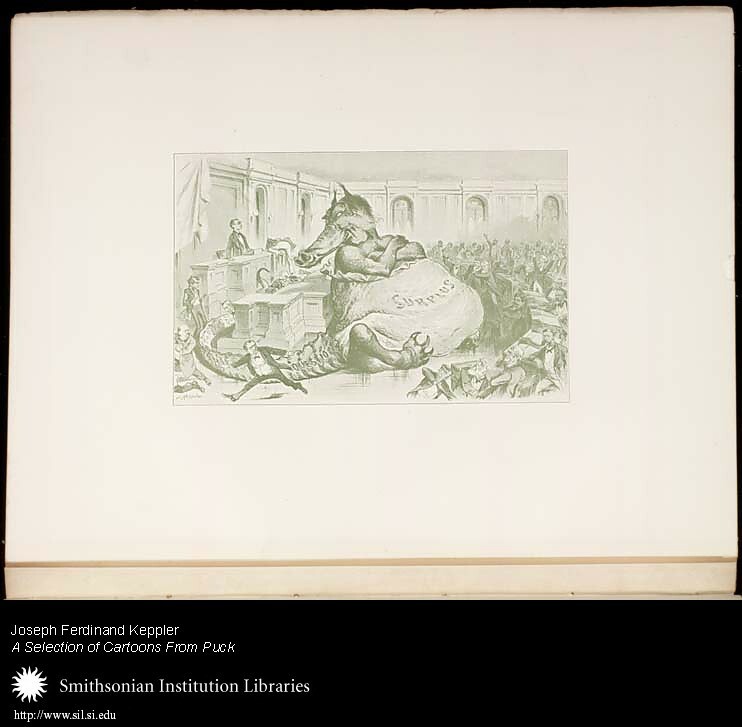 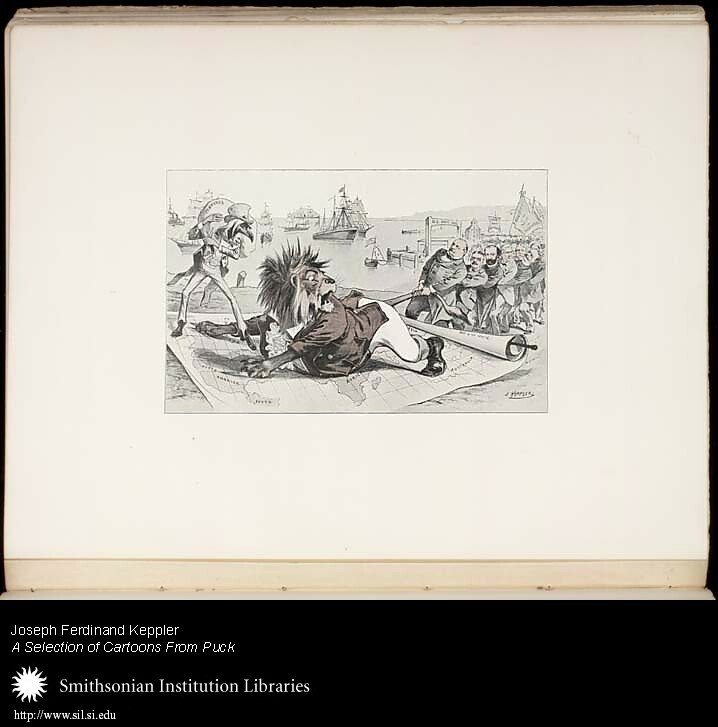 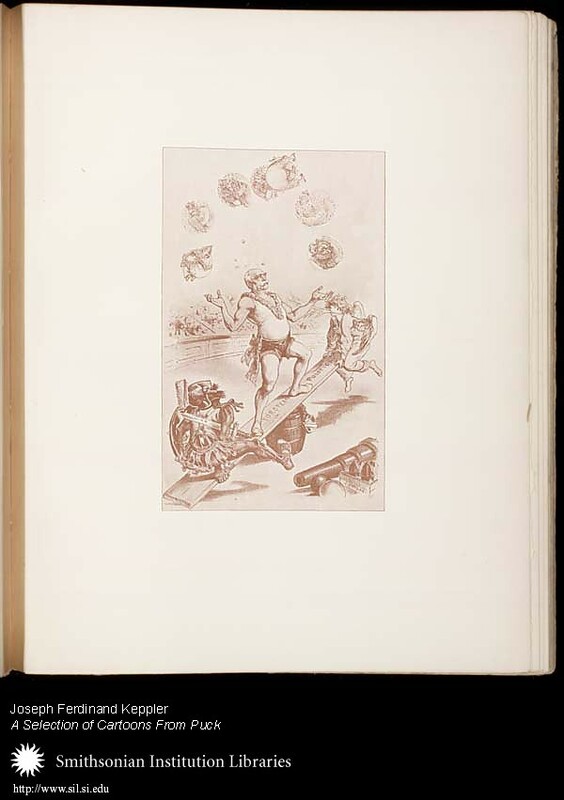 Book: Joseph Ferdinand Keppler, Selection of Cartoons from Puck by Joseph Keppler, 1893. 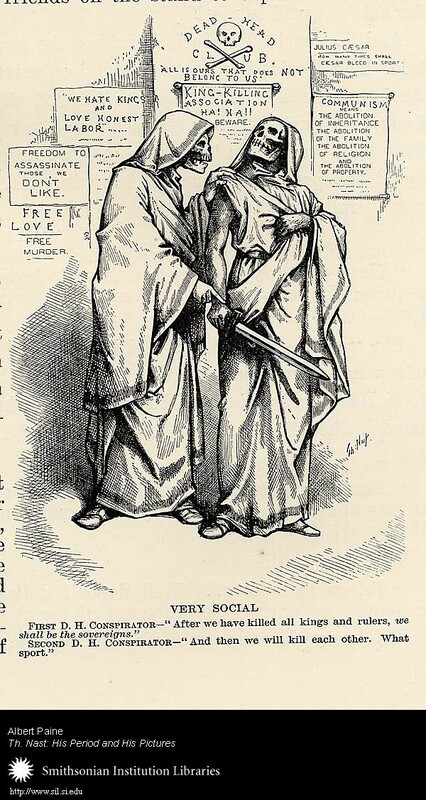 Kentometary: Published in "Puck" February 28, 1877. 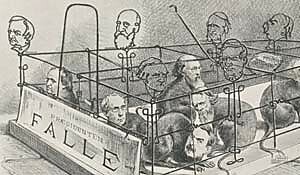 While the idea is based on a pun, it depicts the situation of the Democratic Party in the last months of 1876 with a forceful aptitude and force. 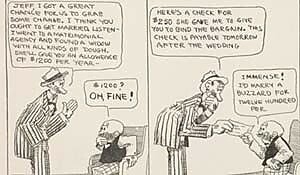 This cartoon appeared at the time when the Democrats in Congress had been tricked into accepting the Electoral Commission scheme, which gave the Presidency to Hays over Tilden. 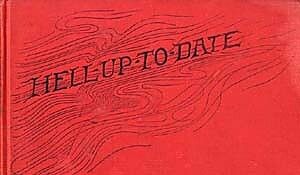 Kentometary: Published in "Puck" January 18, 1888. 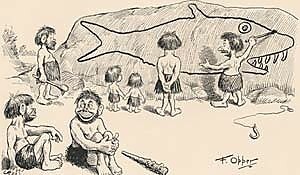 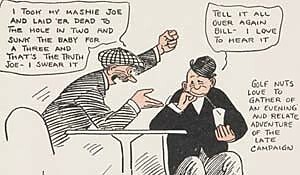 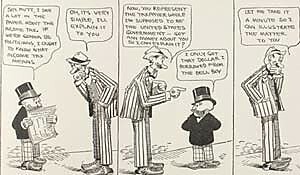 This cartoon was intended to offset accusations that American tariff policy favored English interests rather than those of American protectionists. 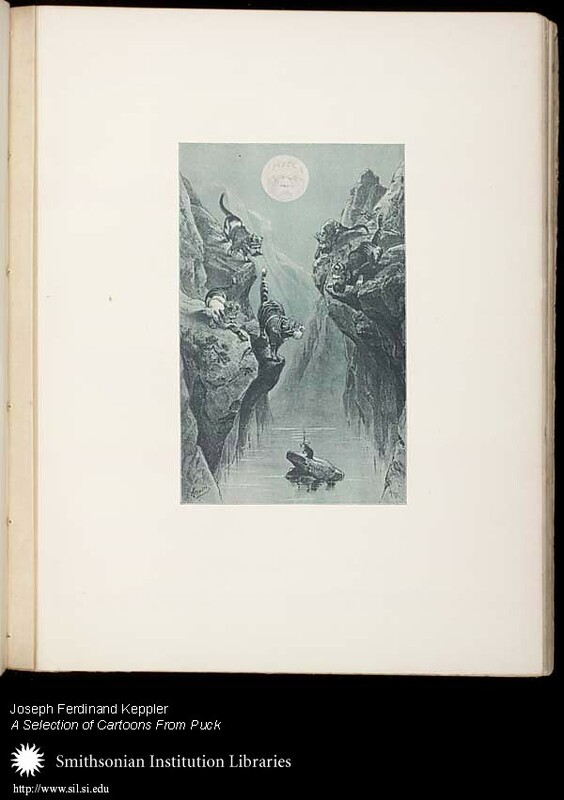 Kentometary: Subtitled: "The Mouse is Safe While the Moon Shines". 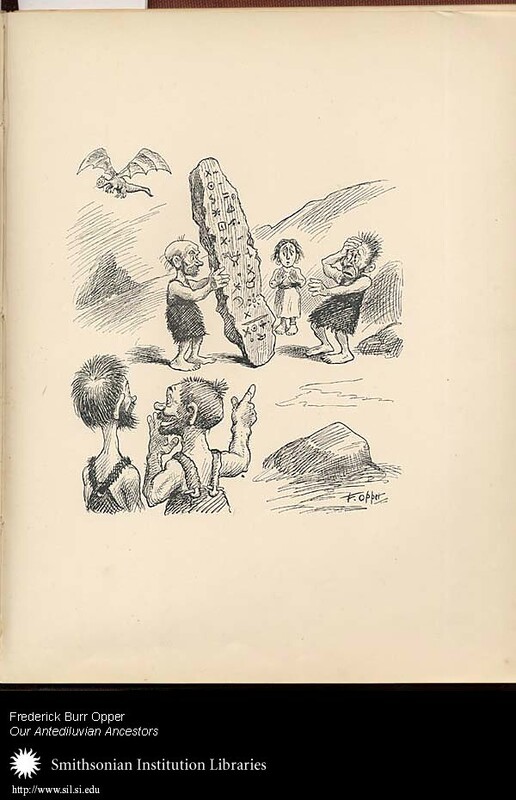 Published in "Puck" February 15, 1888. 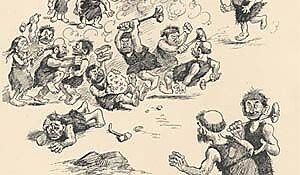 While this cartoon was drawn in 1888, it could have applied to any part of the last ten to twelve years of Bismarck's premiership with little variation. 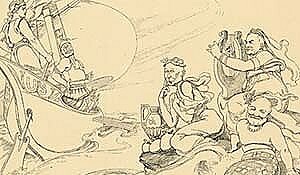 In this cartoon, Bismark is represented by the Moon, which keeps the cats at bay. 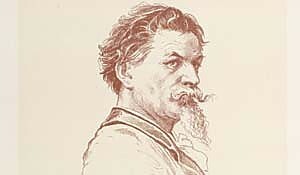 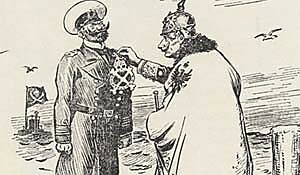 During his premiership, little was done on the political level that was not planned, suggested, shaped, or with the knowledge of Bismarck in some way. 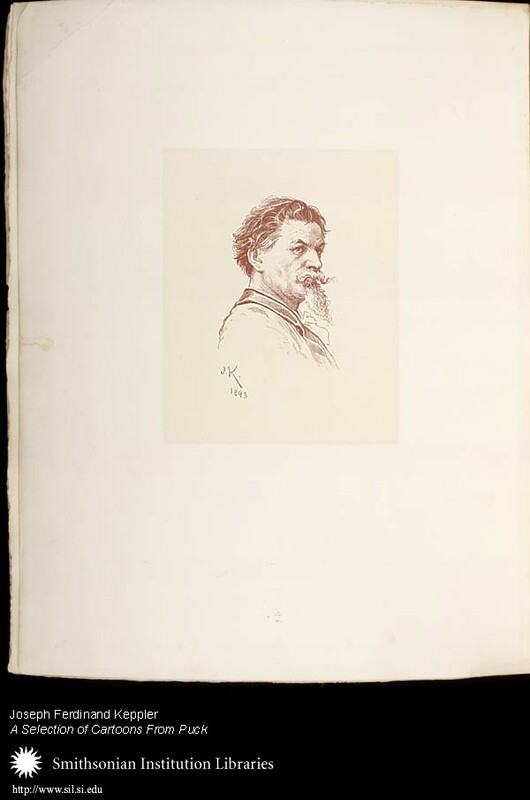 Kentometary: Published in "Puck" March 30, 1887. 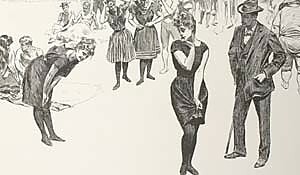 The idea of this drawing is straight forward. 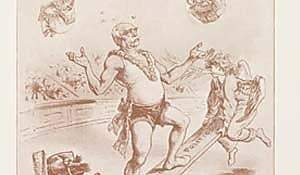 It shows Bismarck involved in a juggling act with the European heads of state ... an act in which any misstep may upset the balancing act between war and peace he is simultaneously performing. 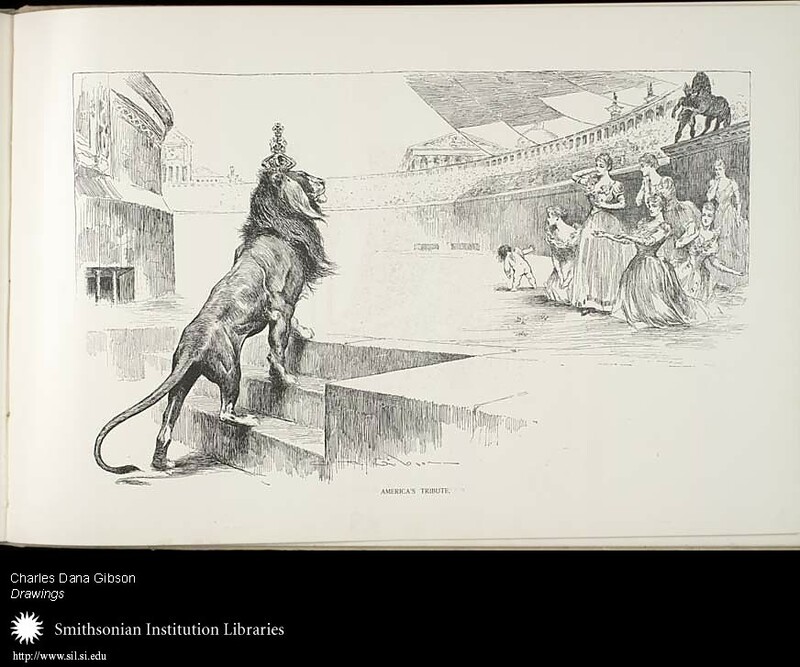 Kentometary: Published in "Puck" May 28, 1890. 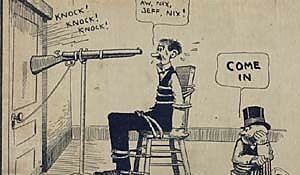 The Louisiana lottery was among the most corrupt public lotteries in the United States, drawing much criticsm and prosecution. 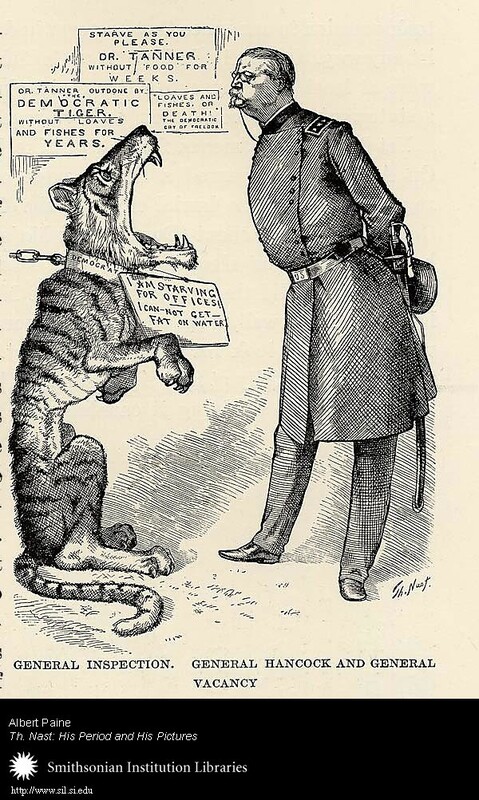 This cartoon appeared at a time when Louisiana was attempting to recover from this disgrace, an attempt that was only partially successful. 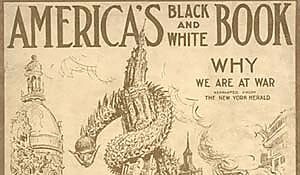 While the original agent of the lottery was dead, his successors' advertisements could still be found in print promoting the scheme for everyone to read, with the exception of the United States District Attorney. 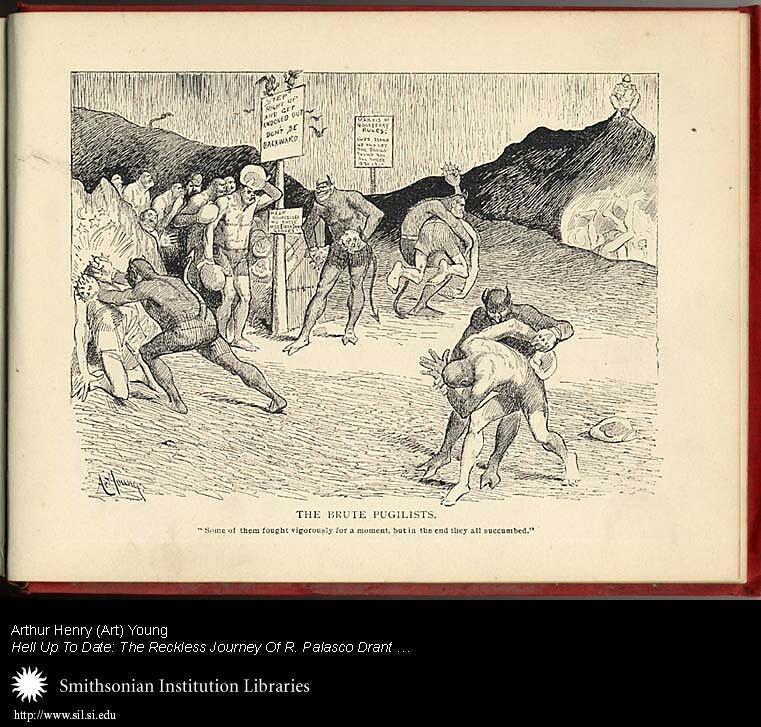 Kentometary: Published in "Puck" December 7, 1887. 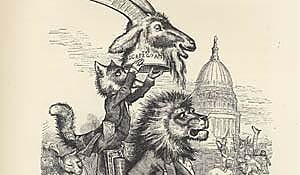 At the re-assembling of Congress in December, 1887, one of the first questions it had to confront was the question of the Surplus. 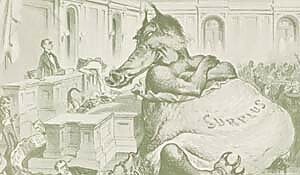 The revenues of the government, especially those coming from customs duties, were so vast that an enormous, useless, cumbersome and dangerous surplus was steadily piling itself up in the United States Treasury. 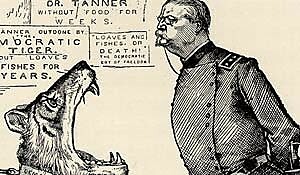 Interestingly, by 1893 the surplus had been nearly wiped out, causing concern that a deficit was on the horizon. 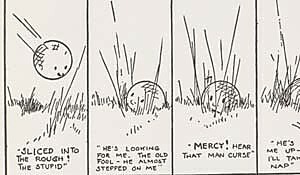 Kentometary: Published in "Puck" November 19, 1890. 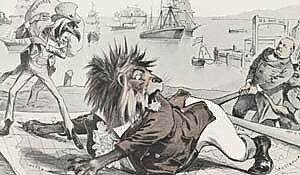 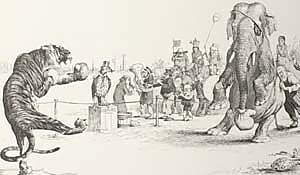 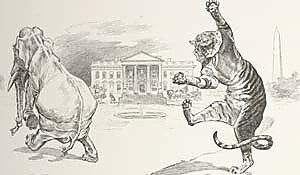 This cartoon correctly attributes the Republican defeat of 1890 to the effect of the McKinley tariff. 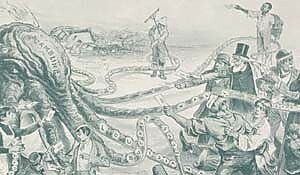 The McKinley Bill resulted in the highest protective tariff in American history to that point with an average rate of 48 percent. 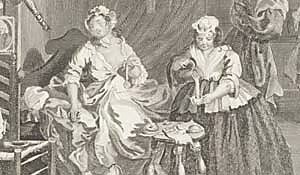 The tariff led to a sharp rise in the prices of many products. 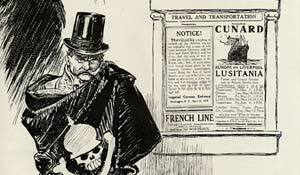 The measure proved to be so unpopular that the Republicans were also defeated in the election of 1892. 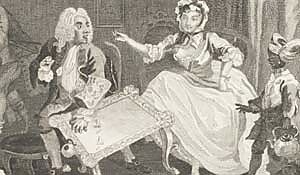 Image Caption: Illustration Number Twenty-Eight -- "What's the matter with Mr. 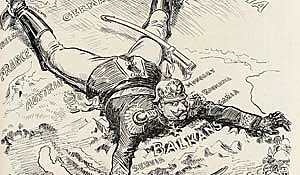 Skinclad?" 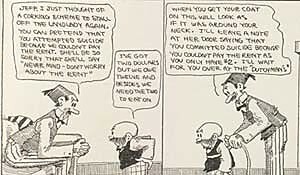 "He's been under Dr. Stonehatchet's care for some time, and the doctor is presenting his bill." 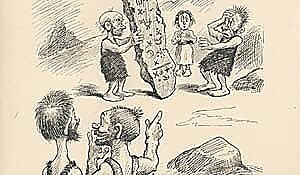 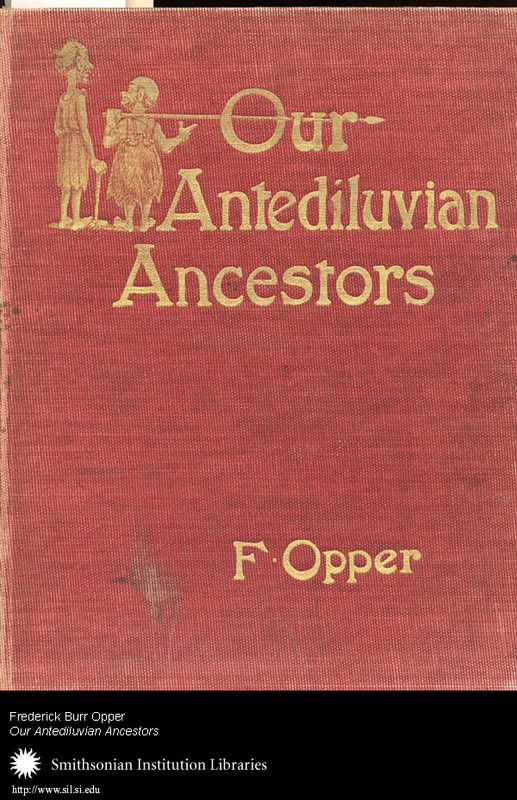 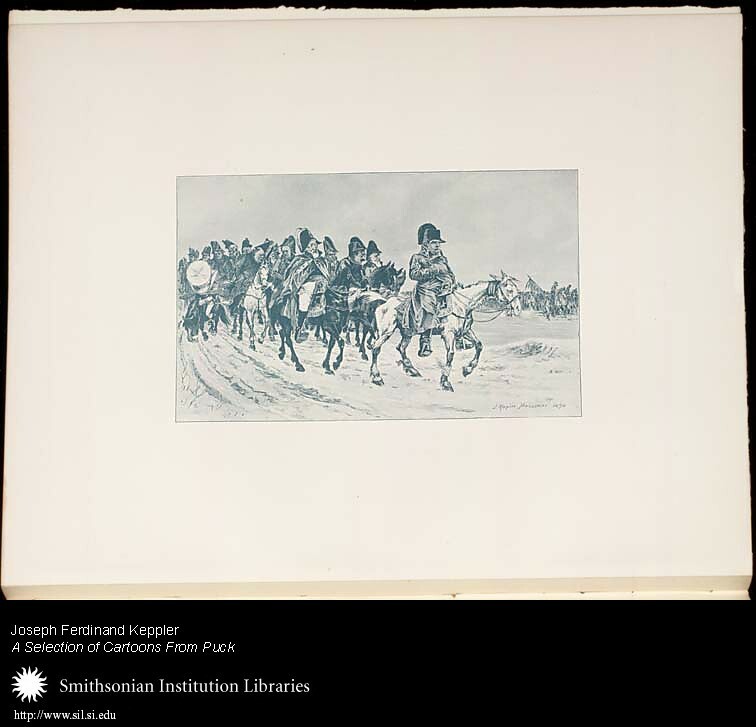 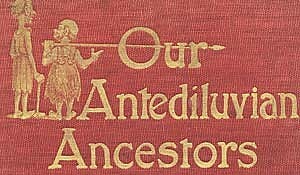 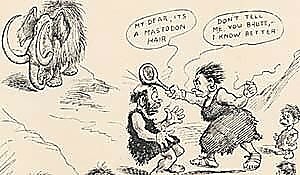 Book: Frederick Burr Opper, Our Antediluvian Ancestors, 1903. 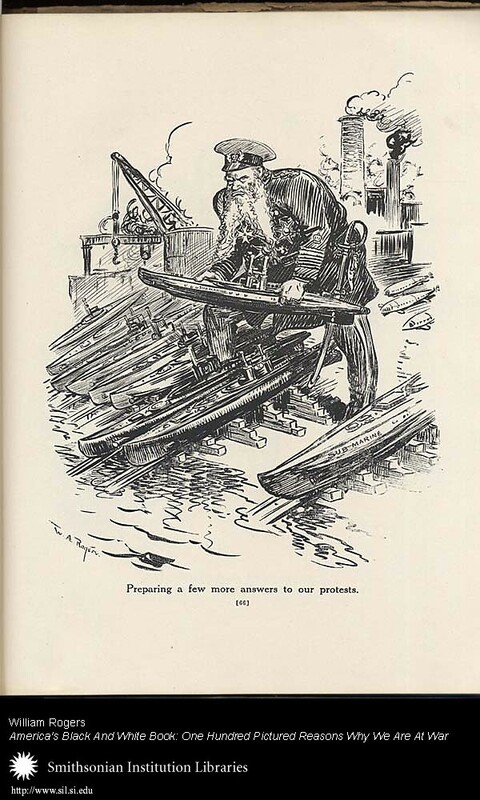 Image Caption: Illustration Number Thirty-Four -- "Stonehatchet and his wife seem to be having a frightful row." 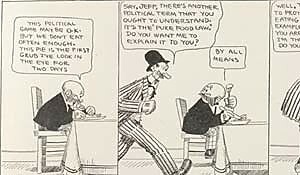 "I should say so! 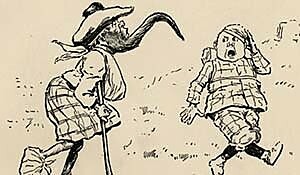 She just found a long red hair on his shoulder." 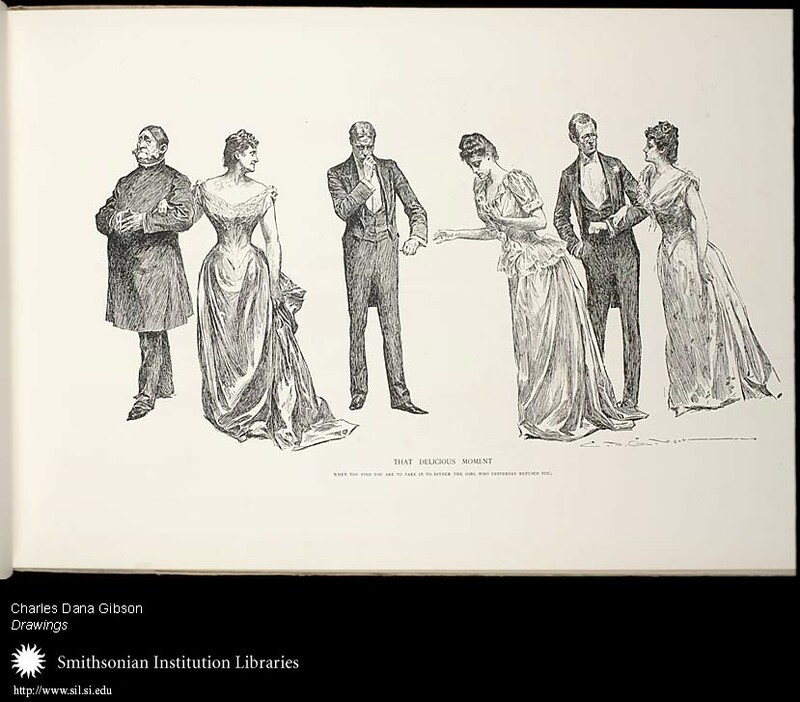 Image Caption: Illustration Number Twenty -- "What's all the row about?" 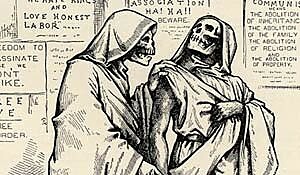 "Why, you know Old Bonescraper died the other day, and those are his heirs. 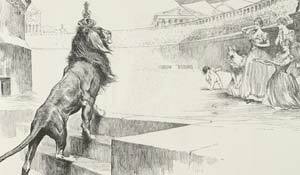 They're contesting the will." 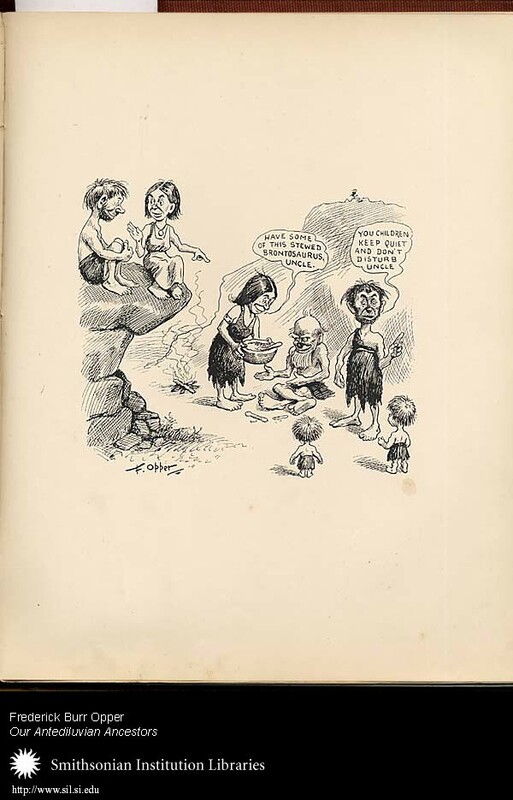 Image Caption: Illustration Number Thirty-Eight -- "What's he making that picture on the rock for?" 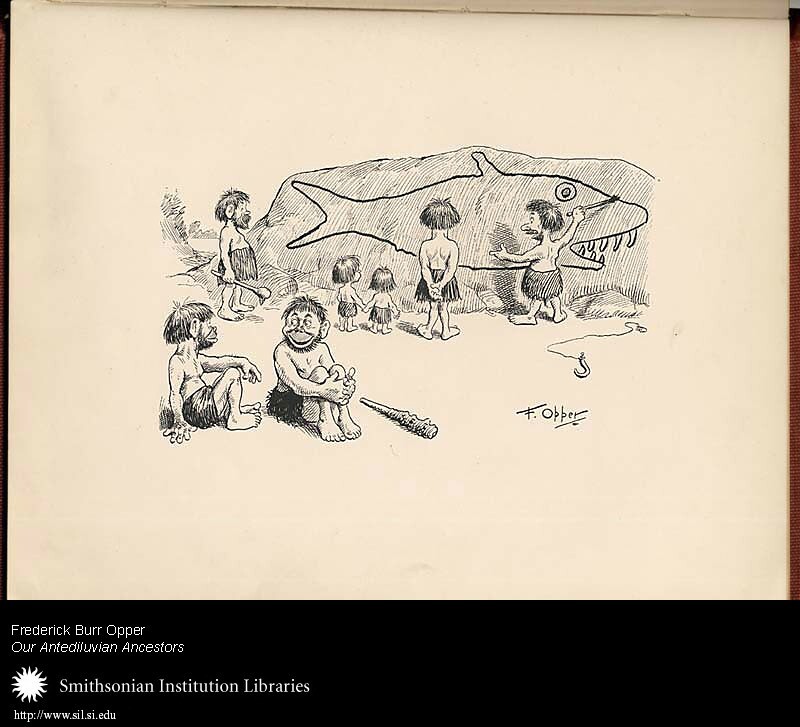 "He's been fishing, and he's showing the size of the sabre-tooth shark that bit his hook but got away." 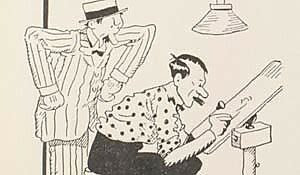 Image Caption: Illustration Number Eight -- "What's the joke, Stonechips?" 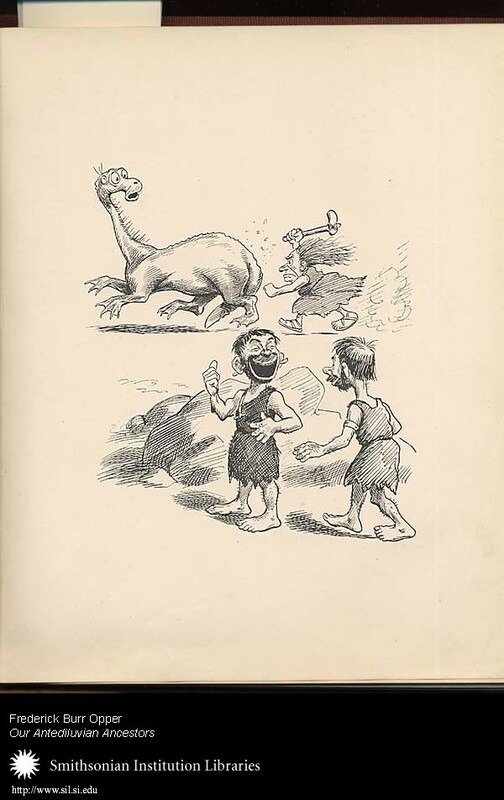 "Look at that Brontosaurus! 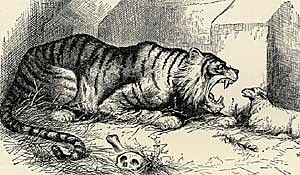 It tried to attack my mother-in-law!" 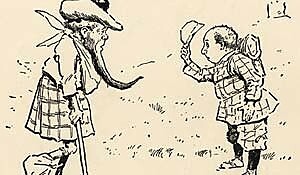 Image Caption: Illustration Number Twenty-Four -- "The Spearheads seem to be awfully good to that old uncle of theirs" "I should say so. 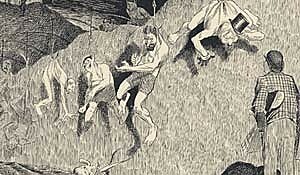 Why, he owns two canoes, three stone hatchets, and half a dozen bearskins, and they're his sole heirs." 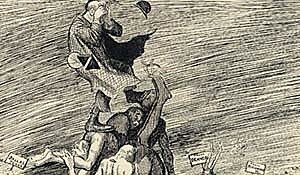 Image Caption: The Millennium. 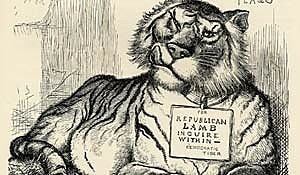 The Tiger and the Lamb Lie Together. 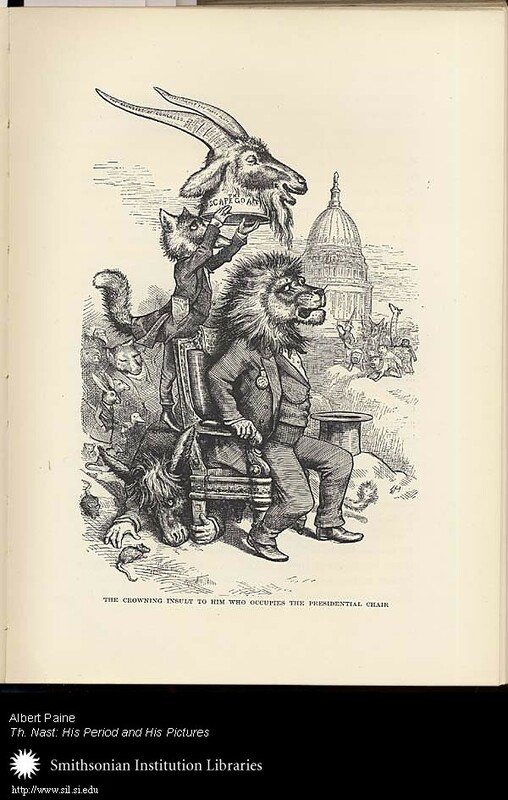 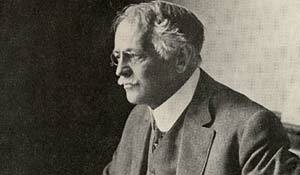 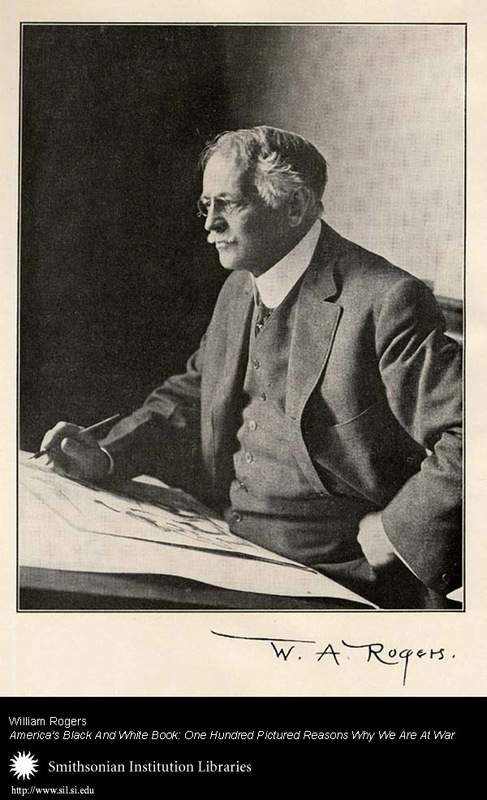 Book: Albert Paine, Th. 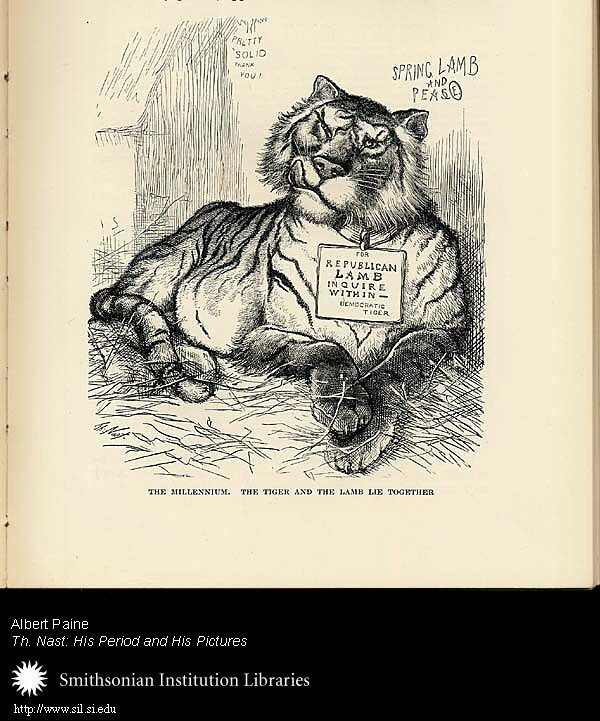 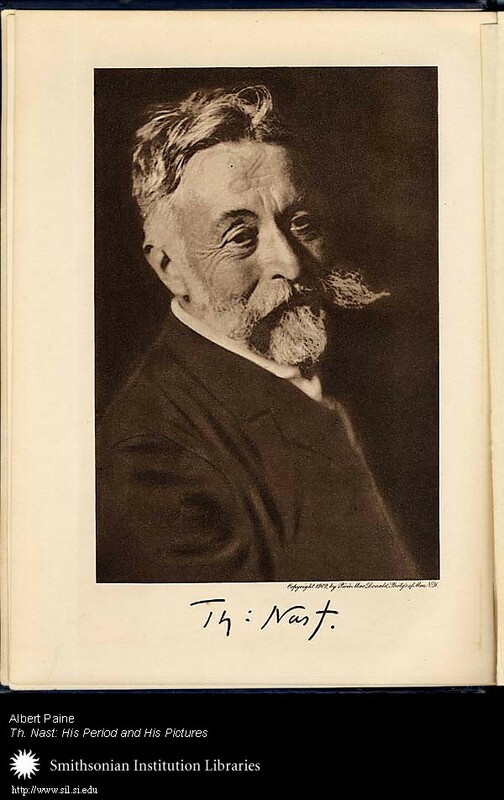 Nast: his period and his pictures, 1904. 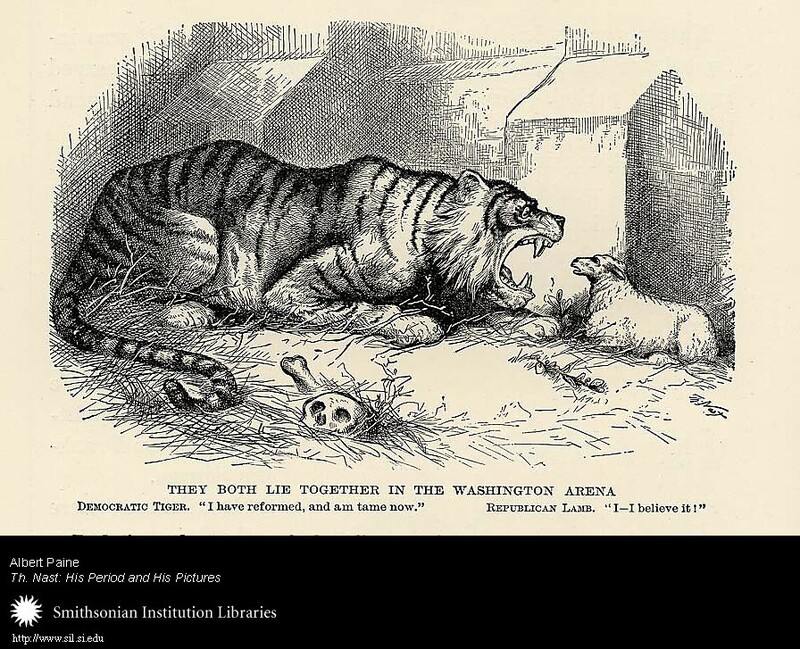 Image Caption: They Both Lie Together in the Washington Arena. 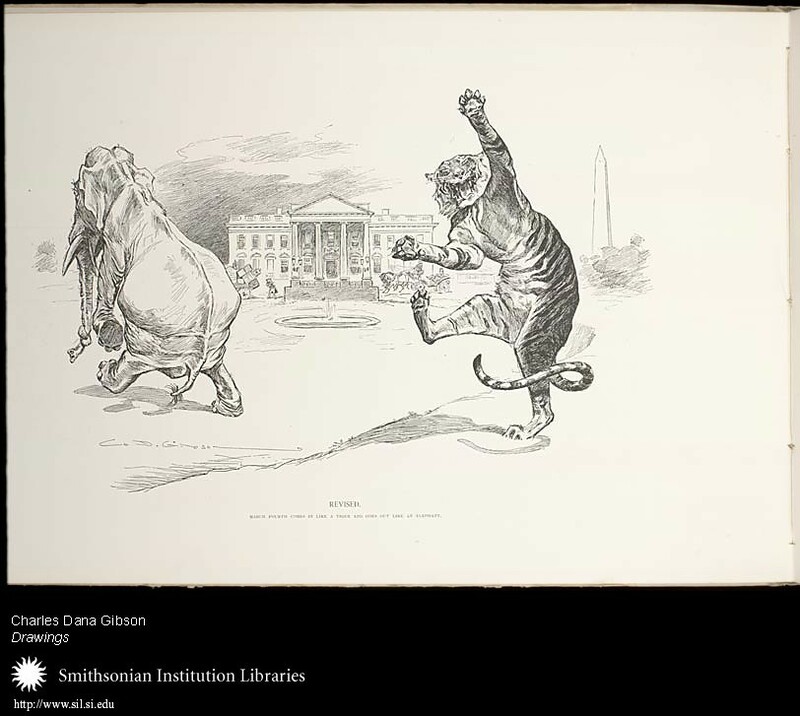 Image Caption: The Crowning Insult to Him Who Occupies the Presidential Chair. 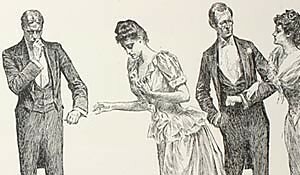 Image Caption: General Inspection. 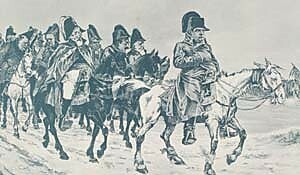 General Hancock and General Vacancy. 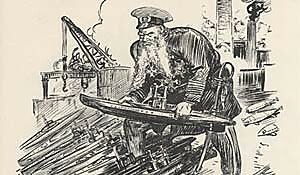 Image Caption: Preparing a few more answers to our protests -- "Germany was ready to talk about restricting 'U' boat activity as long as we would listen to her; but the sound of riveting machines in her shipyards was her real answer." 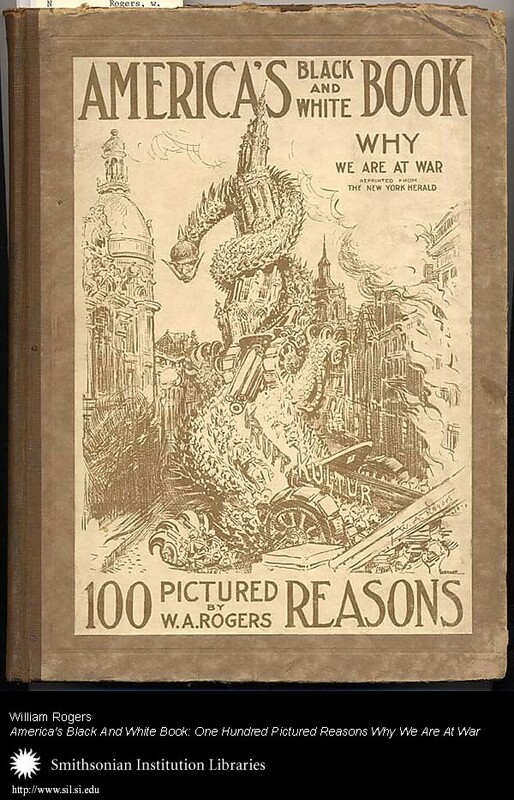 Book: William Rogers, America's black and white book: one hundred pictured reasons why we are at war, c1917. 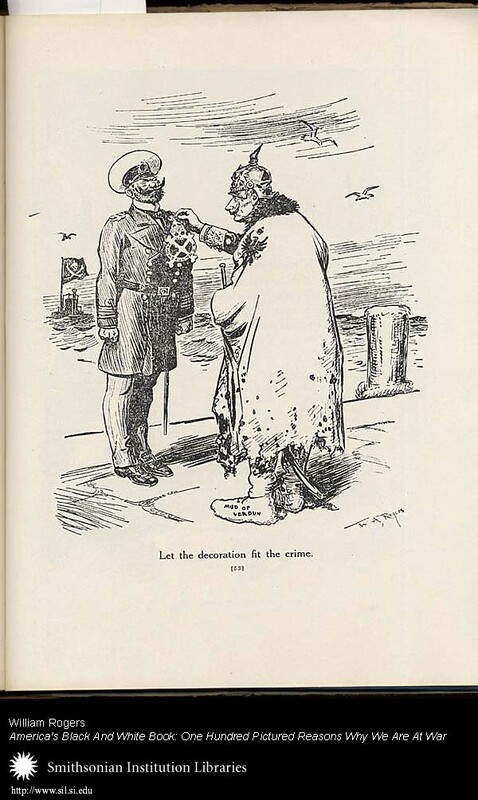 Image Caption: Let the decoration fit the crime -- "It was asserted and has never been denied, by the German Government, that the Kaiser decorated the commander of the 'U' boat which sank the Lusitania." 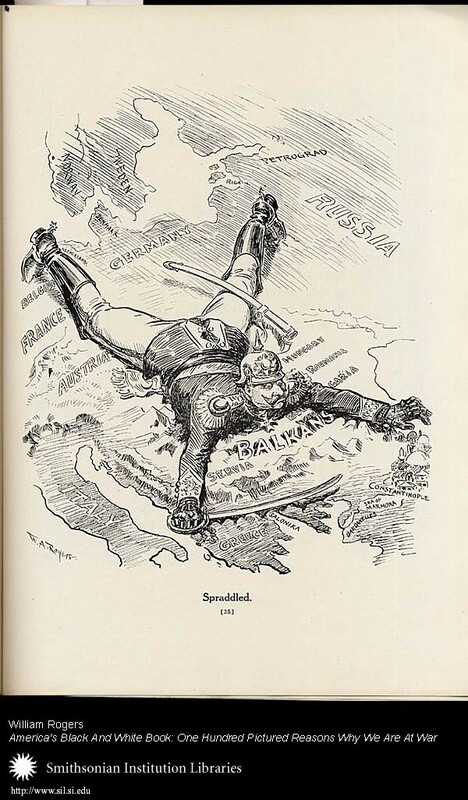 Image Caption: Spraddled -- "It looked as though the German Army was spread over too much territory--faced too many fronts to be effective!" 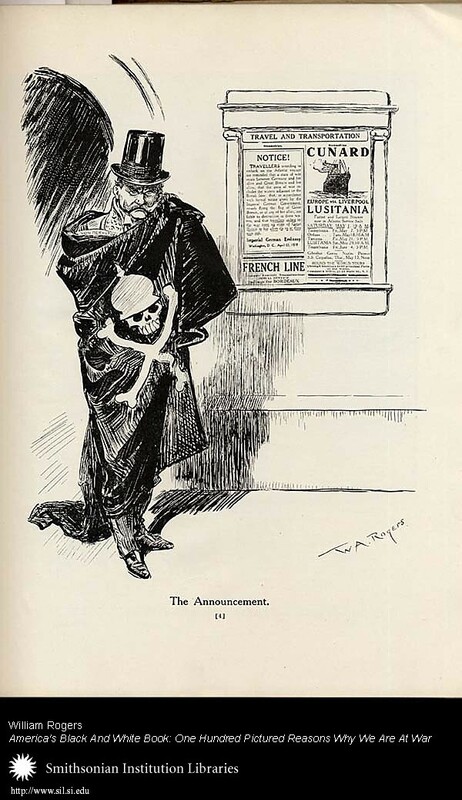 Image Caption: The Announcement -- "The blackest count in the indictment against Germany is foreshadowed in the warning by the Imperial German Embassy at Washington to all Americans, of the crime which was to follow on May 7th, 1915." 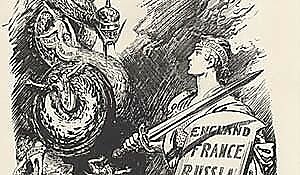 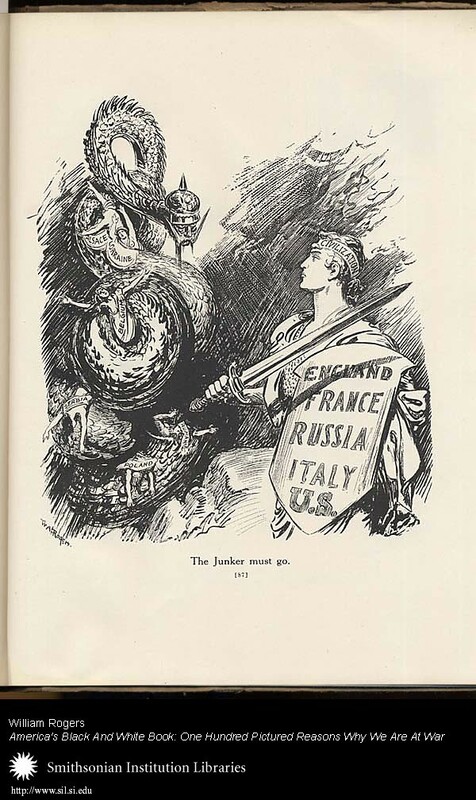 Image Caption: The Junker must go -- "England, France, Russia, Italy and the United States recognized that the Junker menace to the world must be thoroughly crushed before Peace could ever return to the world." 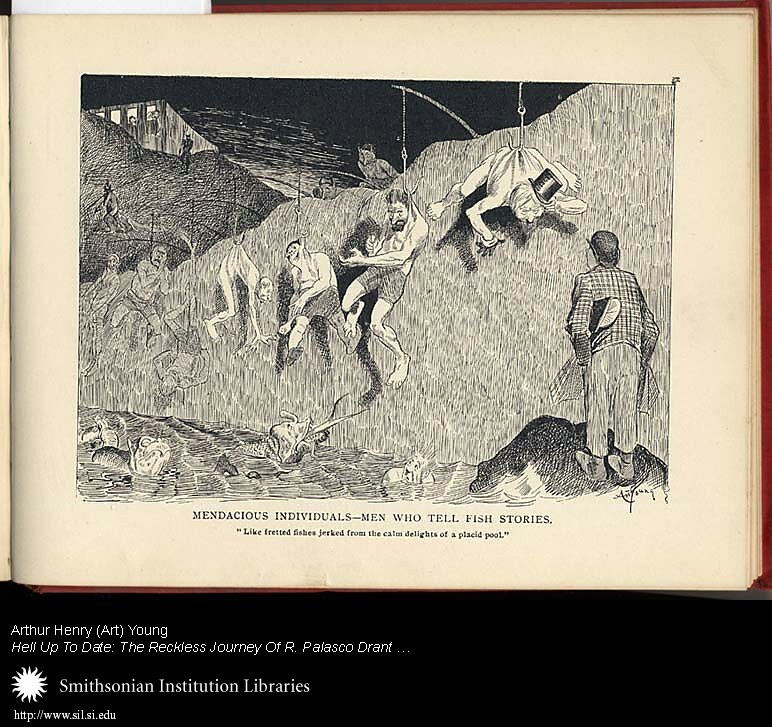 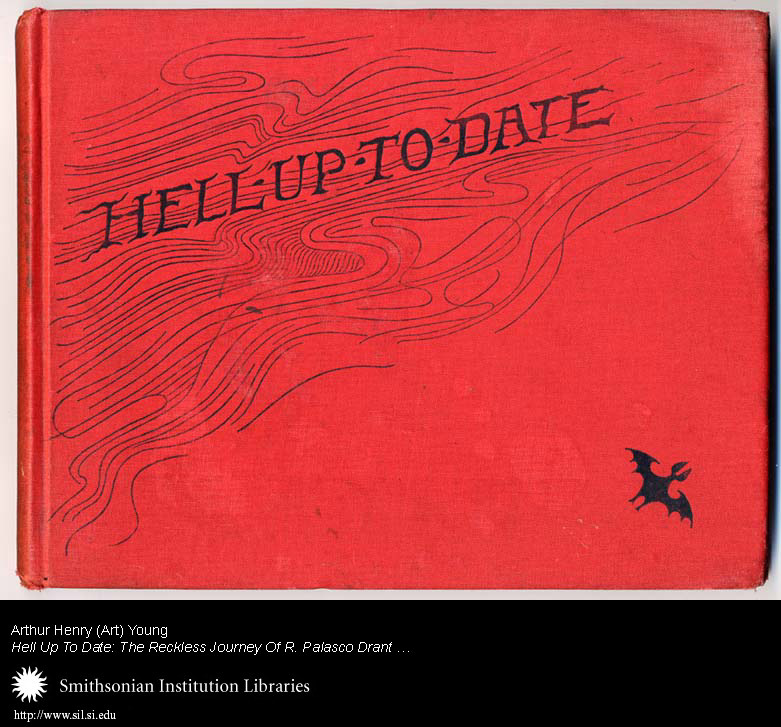 Book: Arthur Henry (Art) Young, Hell Up to Date: the reckless journey of R. Palasco Drant, newspaper correspondent, through the infernal regions, as reported by himself, c1893. 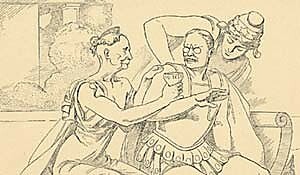 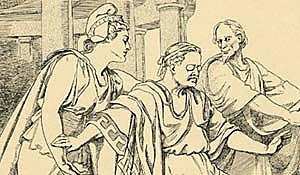 Image Caption: The Brute Pugilists -- "… I looked into a large enclosure, and saw the mode of punishment that Judge Minos, in his severest mood, metes out to the professional pugilist. 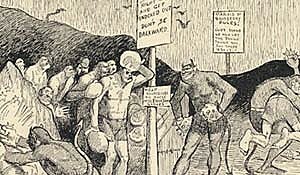 The sluggers were holding glove contests with the most powerful of the demons. 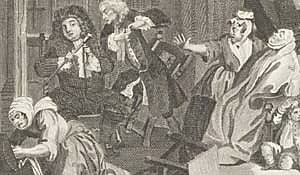 Some of them fought vigorously for a moment, but in the end they all succumbed. 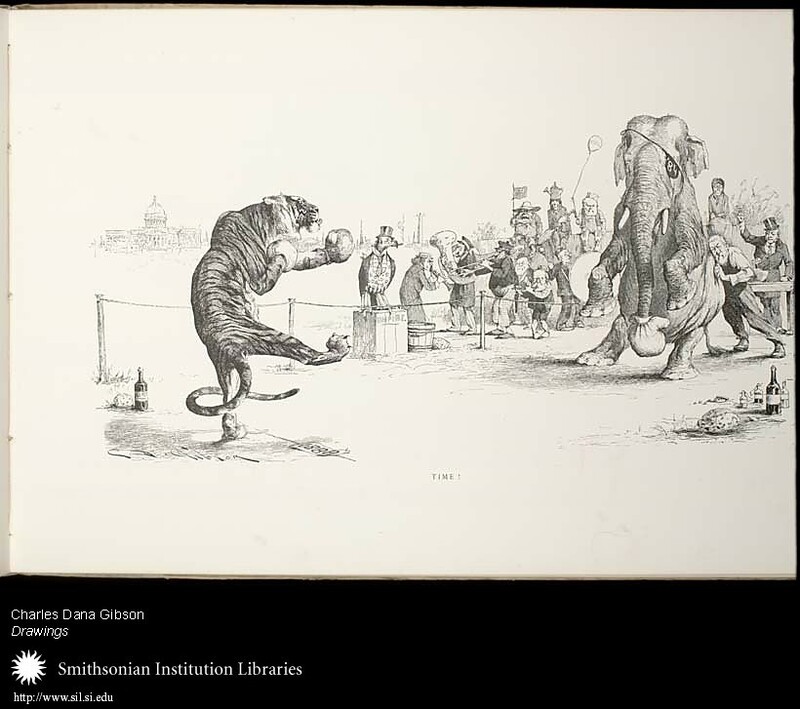 As the demons wore gloves covered with short iron spurs and the pugilists had only the regulation mitten, with eight ounces of padding, the contests were rather one-sided." 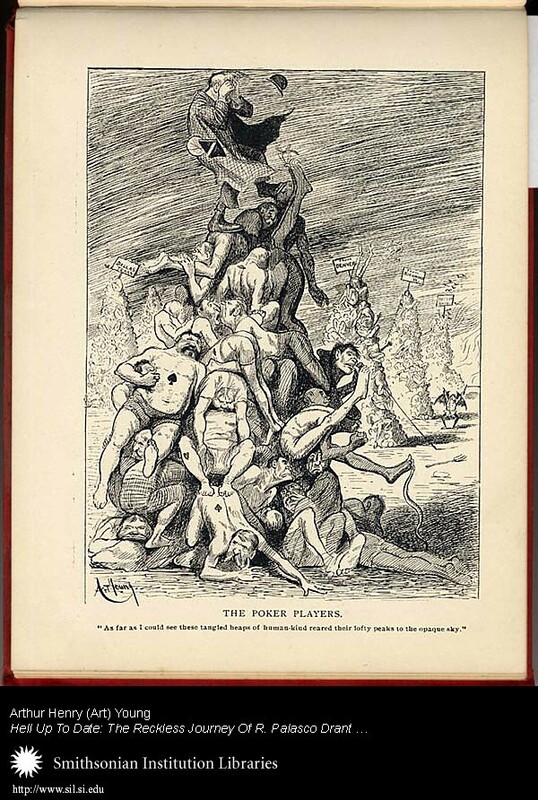 Image Caption: The Poker Players -- On "the plain of Pokerdom … the hot wind was blowing strong. 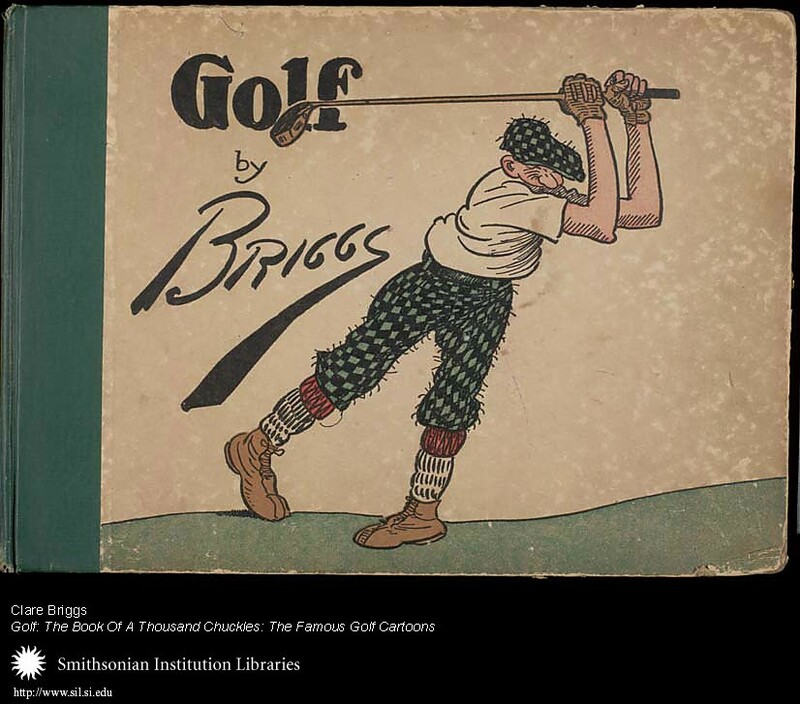 The signs rustling in the stacks swung to and fro with the breeze. 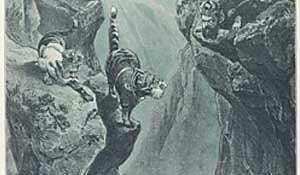 Just as far as I could see, these tangled heaps of humankind reared their lofty peaks to the opaque sky, while the bats swung around them and built nests in their whiskers." 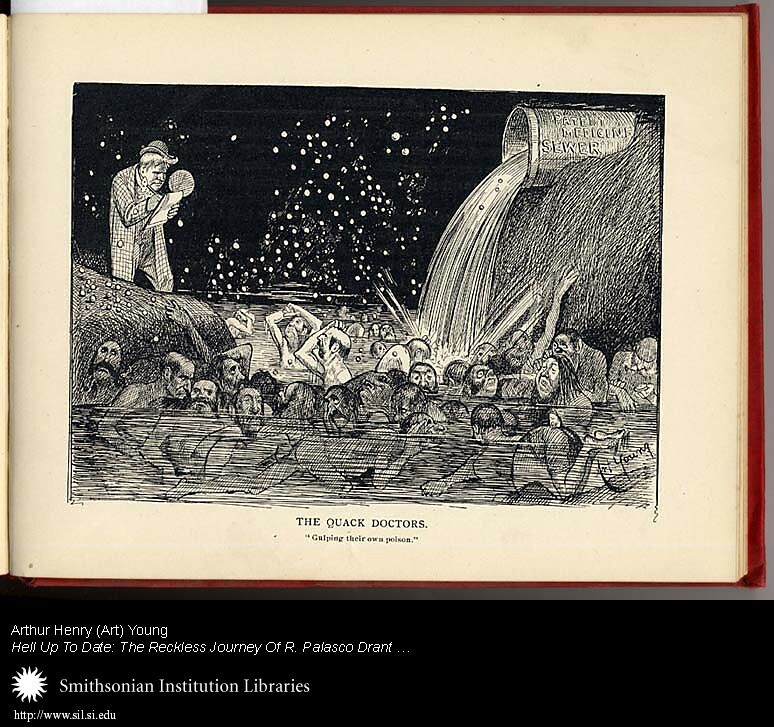 Image Caption: The Quack Doctors -- "The sewers of Hell are flushed with patent medicines. 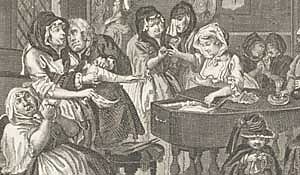 Wallowing in this stream of mysterious decoction are the souls of the quack doctors, gulping their own poison. 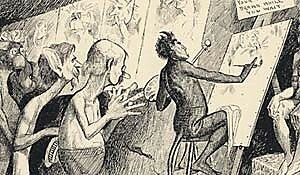 To add to the punishment, unceasing showers of large pills descend, the doctors frantically beating the air in their endeavors to ward off the bitter storm." 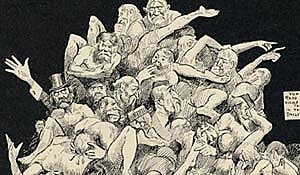 Image Caption: Mendacious Individuals--Men Who Tell Fish Stories -- "… I came upon the men who are given to falsehoods, particularly men who were fond of telling 'fish stories.' 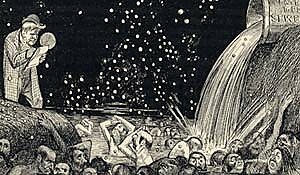 These sinners are hung up on fish-hooks over a boiling lake, where, through the long, hot ages, they writhe and squirm like fretted fishes jerked from the calm delights of a placid pool." 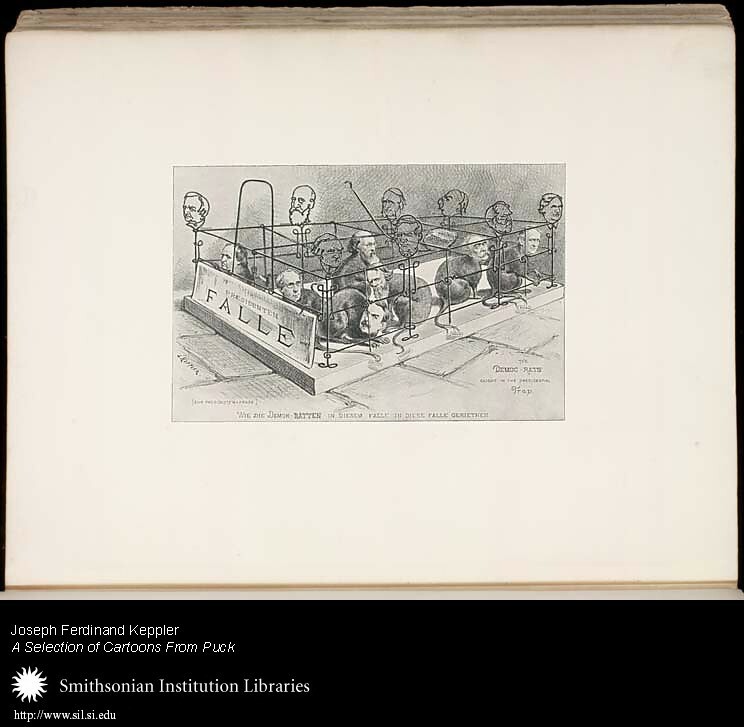 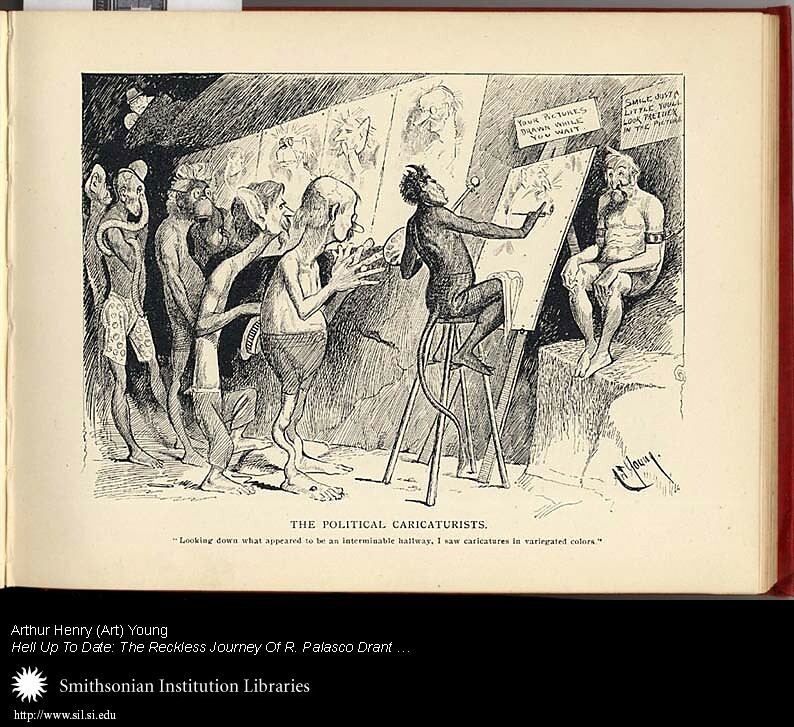 Image Caption: The Political Caricaturists -- "The demon cartoonist first makes a caricature of his victim; then the victim is pulled and twisted, rolled and kneeded, until his resembles in every way the demon's fanciful conception." 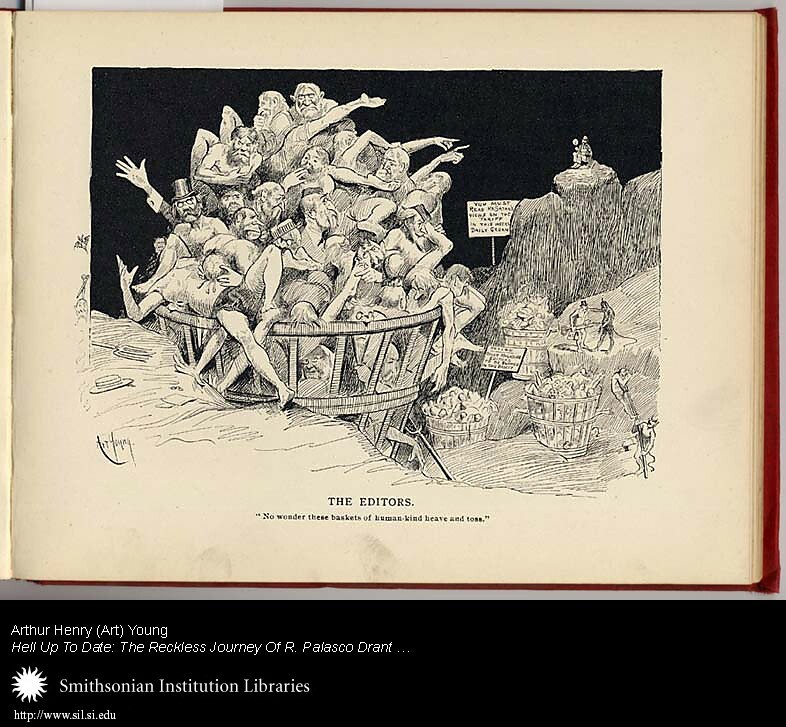 Image Caption: The Editors -- "Editors who take an awful satisfaction in rejecting manuscripts are piled in huge, red-hot iron waste-baskets. 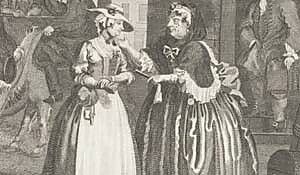 Those, also, who sin by swearing falsely to the circulation of their papers are here. 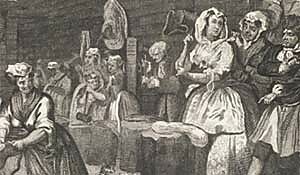 They are put down deep into the bottom of the baskets …"